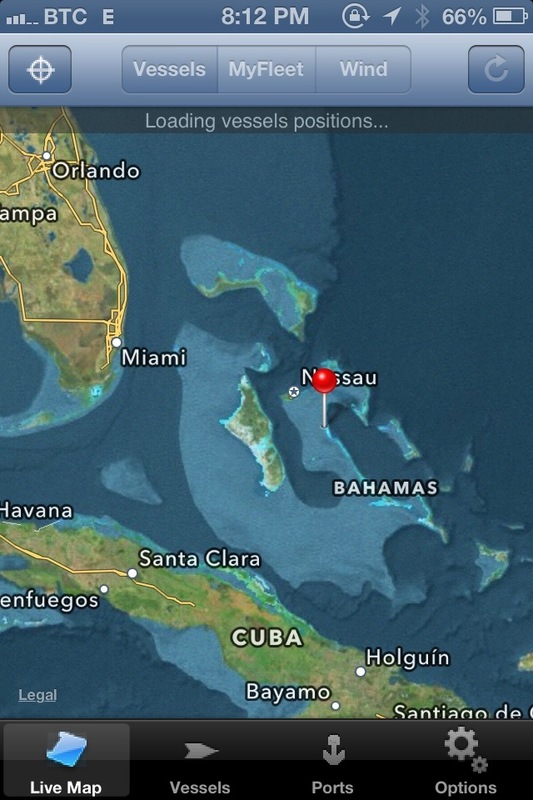 We motored out of Nassau ,buddy boating with “Nemo” and were granted permission to leave via the West entrance and soon had a comfortable sail going with all three sails deployed. 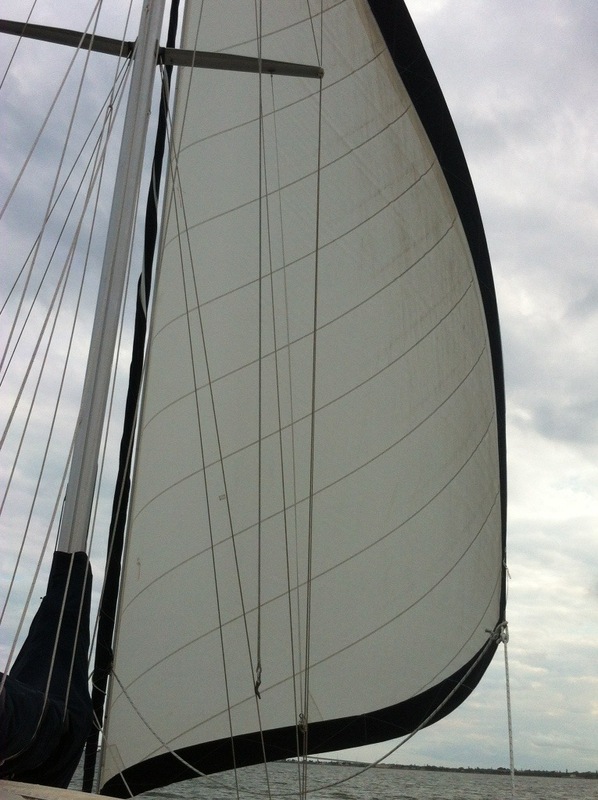 We were maintaining a 4.5 kt sail close hauled in E8 kts of wind. We could see the bottom about 12 ft below us go by with an occasional black Manta Ray, or brown coral head dotting the otherwise white sandy bottom. 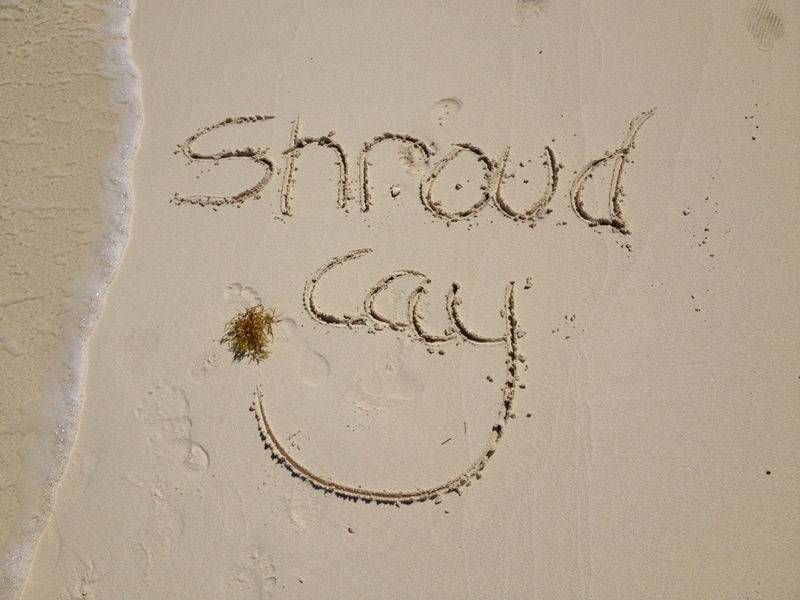 We arrived and anchored about 500 yards off a beautiful white sandy beach and had a relaxing dinner and star gazing evening. 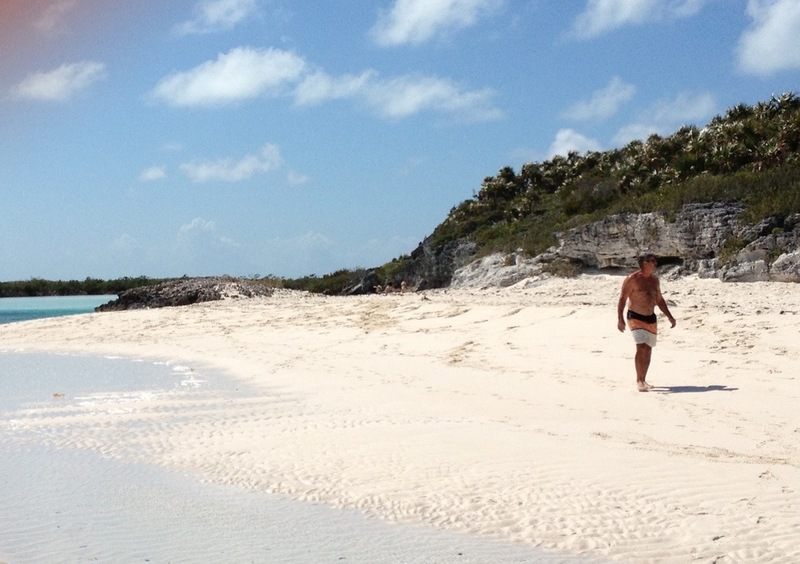 The next day we dink’d ashore and explored the beach. To Adrien’s delight Nemo’s crew loves to forage as he does. 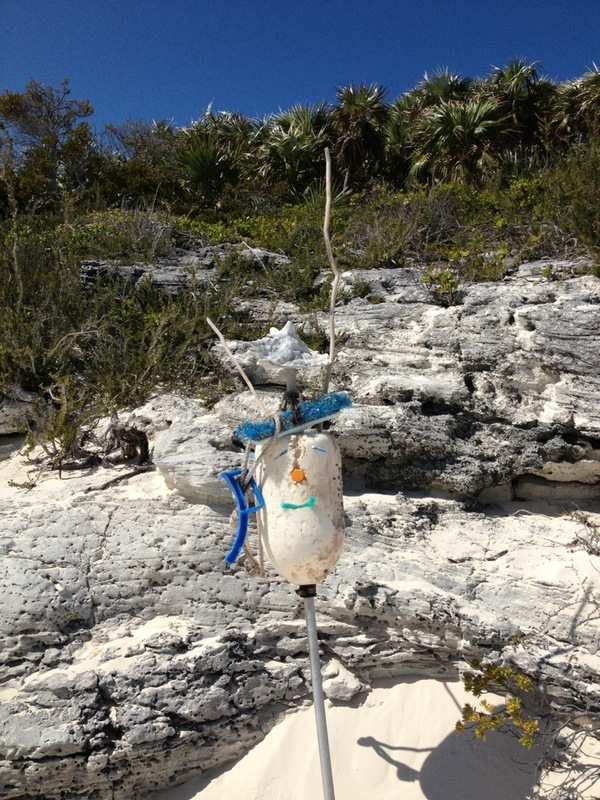 It wasn’t long before treasures worth bringing back to the boat were discovered, a piece of line, a heavy duty stainless steel ratcheted tie down in mint condition, a plastic container for bailing, someone’s cash of live conch. …. ( I insisted we leave those where we found them!). We walked the runway that Carlos Lehder laid to foster his drug trafficking activities in the late 70’s. 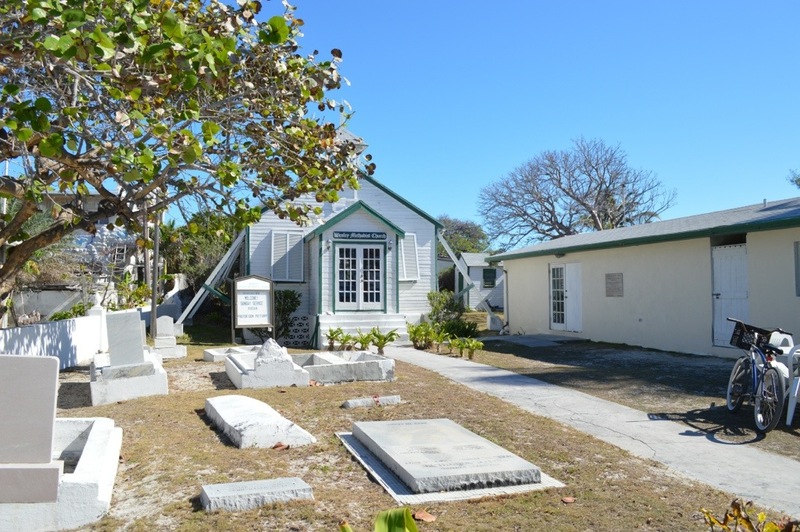 and his abandon home overlooking the harbor and other aluminum building left untouched for many years. Despite the building being stripped of windows, doors, fixtures etc. the foil and floral wallpapers in each room were still in tack! As interesting as it is to explore ruins of time gone by it was sad to see all the garbage left behind. Old vehicles, rusted machinery, air conditioners, steel drums, stacks and stacks of beer bottle in boxes, plastic containers….. There was litter everywhere. It appears that when folks leave, because of storm destruction or in Mr. Lehder’s case, to go to jail (BTW, he’s still there) they literally walk away from everything. Anything of value is taken out but the garbage remains….then gets blown around with the wind. Evidence suggest even cruisers are leaving their garbage behind. Very sad. 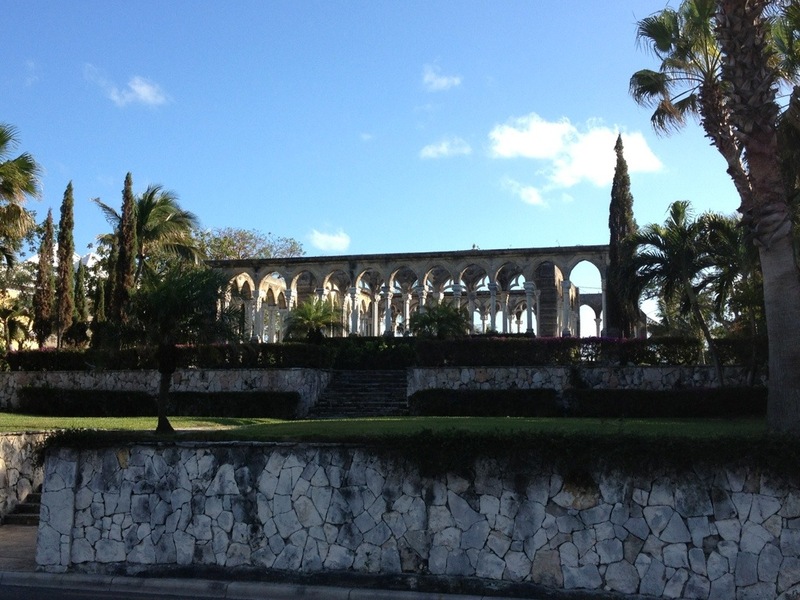 Nassau was similar. There just doesn’t seem to be any pride in preserving the beauty of this area by the locals and some disrespectful cruising guests. 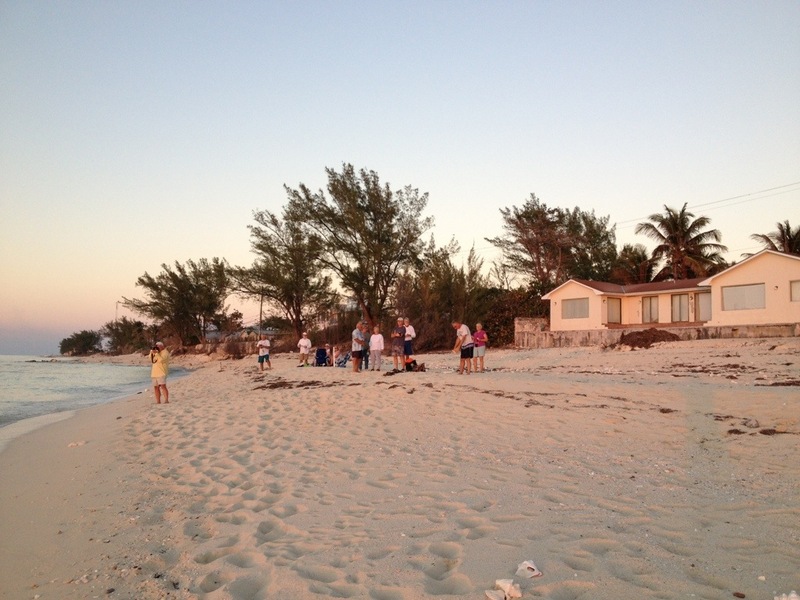 Is it lack of education, the cost of keeping it clean, or a place to dispose of the trash…… We’re just not sure. We’d anticipated have a juicy Burger at The Beach Club but learned that Hurricane Sandy took it down and the reopen will not be til June. Darn, I thought sure I could smell burgers on the grill! We dink’d to a small pristine sandy island with one Coconut tree, dove on the wreck of a DC 10, also remnents of Mr Lehder, and saw some spectacular marine life under the fuselage and wings. From there we dink’d across to Way Cay, where greeted by Geoffery, a caretaker from Haiti , who offered to take us on a tour of the facility. 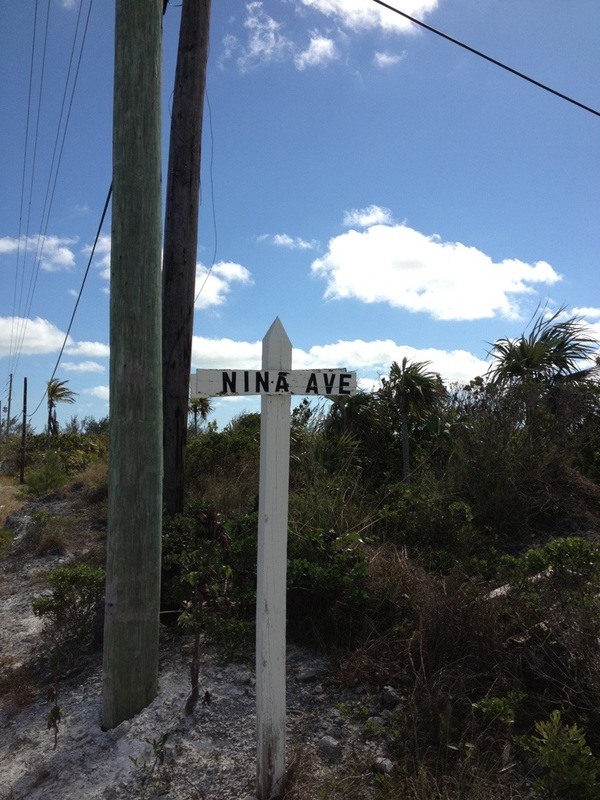 They began construction on this island 11 years ago. 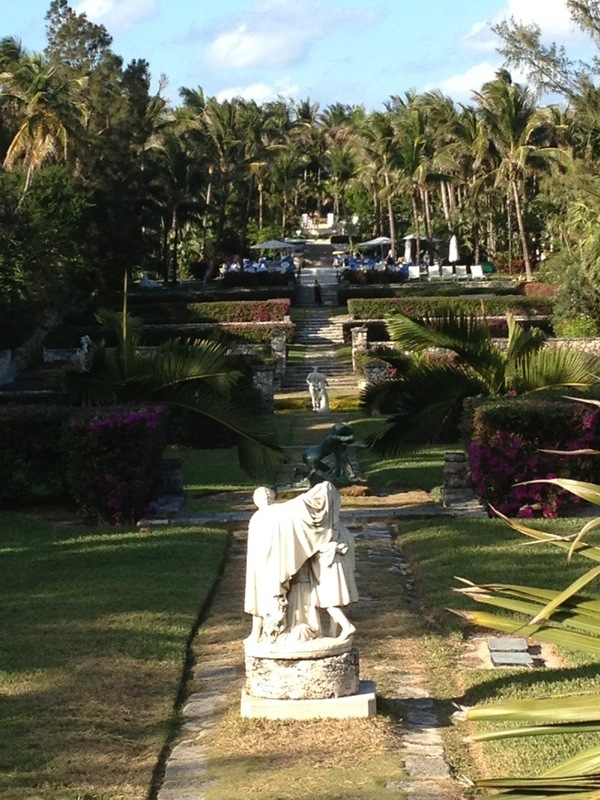 They imported homes from Bali that had been disassembled and then reassembled as they are today in this resort. 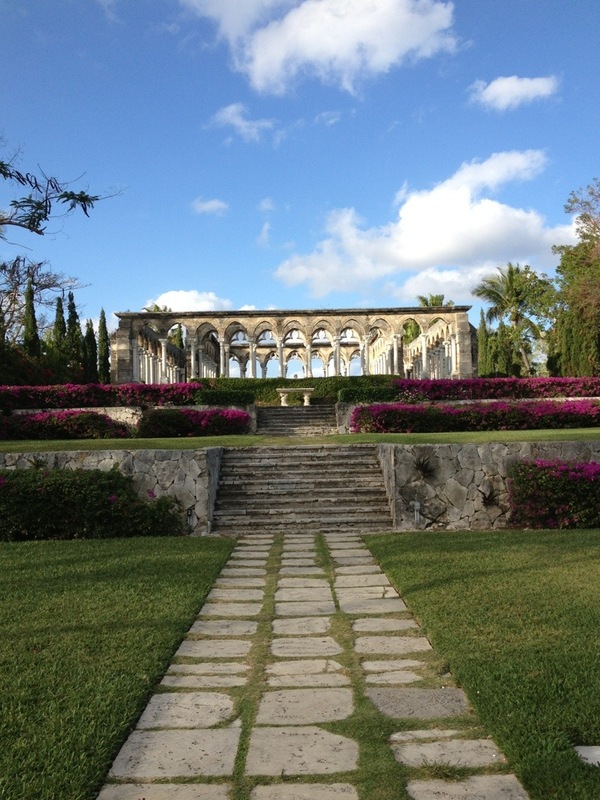 They feature beautiful carved beams, thatched roofs, marble floors and beveled glass windows. Just beautiful! 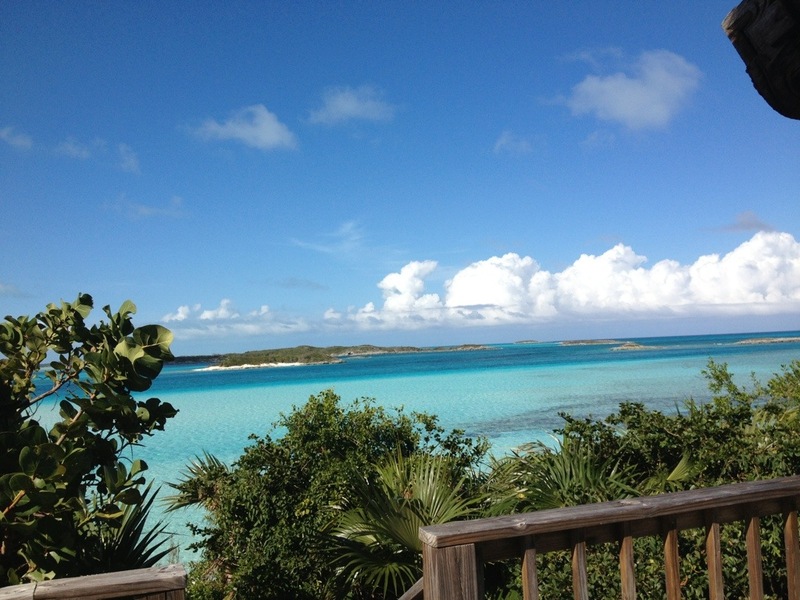 Each one bdrm unit had its own private sun deck, path to their own private beach, out door showers and incredible views! They have a dining building with first class kitchen and chef brought in to cook meals, although each unit has its own stocked kitchen, and a social/ room. 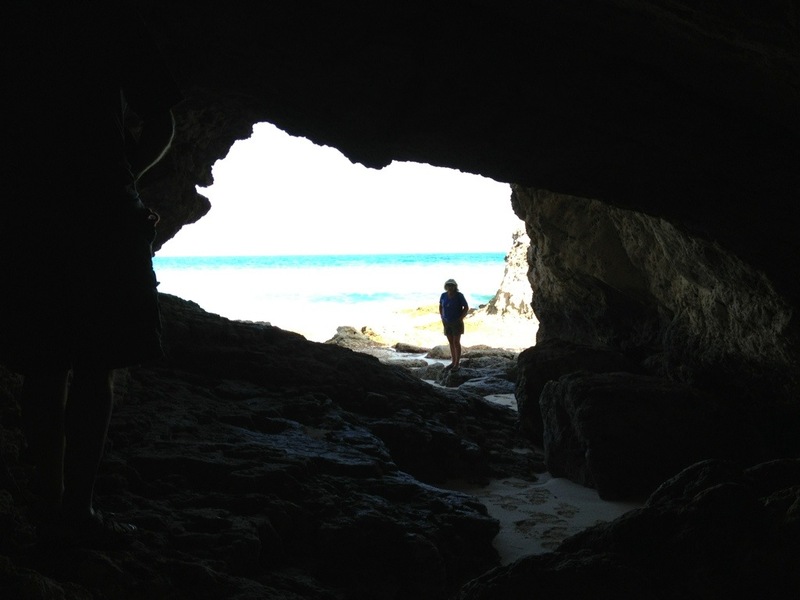 If you are looking for a getaway, check this one out! That night on board “Nemo” we created some delicious Piña Coladas , using frozen pineapple instead of ice and enjoyed another relaxing, delicious dinner on board. 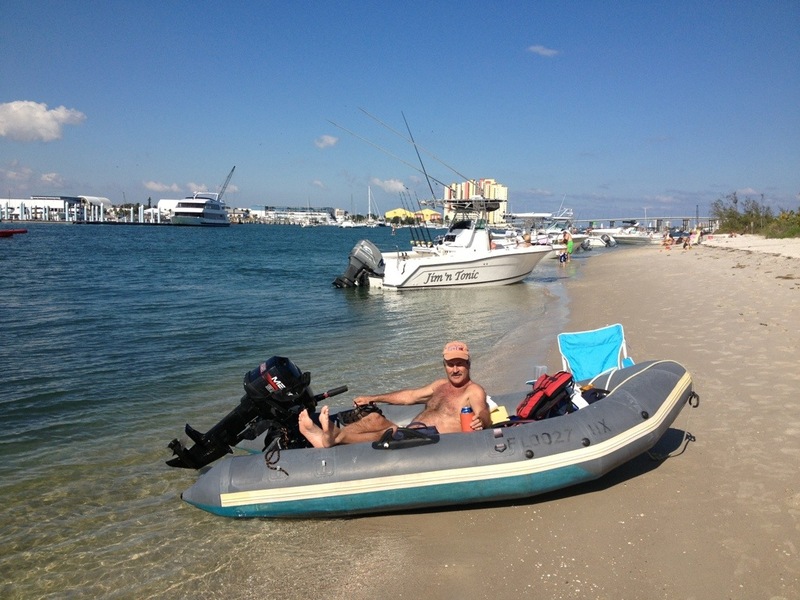 The next day we took a 4 mile dink ride to Shroud Cay and rode up a scenic, winding, shallow, sandy bottomed river that eventually brought us to a beautiful beach on the eastern shore. We walked the beach, climbed a hill and took in some great views. 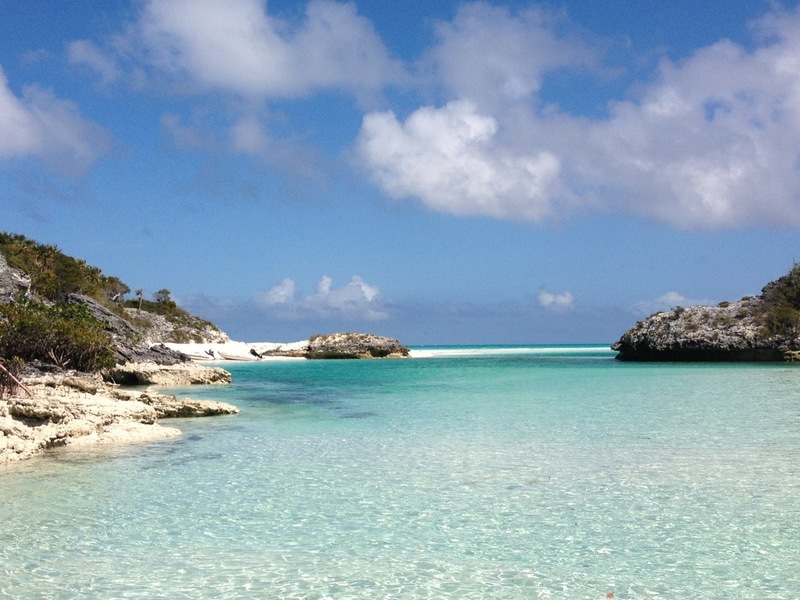 low tied offered a beautiful sandy beach, and a perfect snorkeling opportunity. 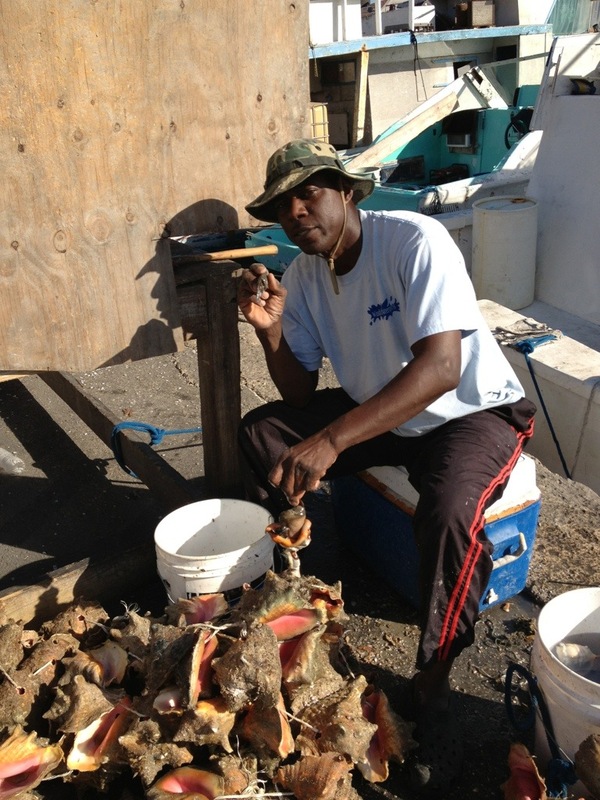 On our dink ride back to the boat we hugged the shore of north of Way Cay Cut and picked up several mature Conch to open. The next morning Adrien and Don went to shore to open 5 conch and after Nina gave a demonstration on cleaning them we lifted anchor and continues south the Wardwick Wells. 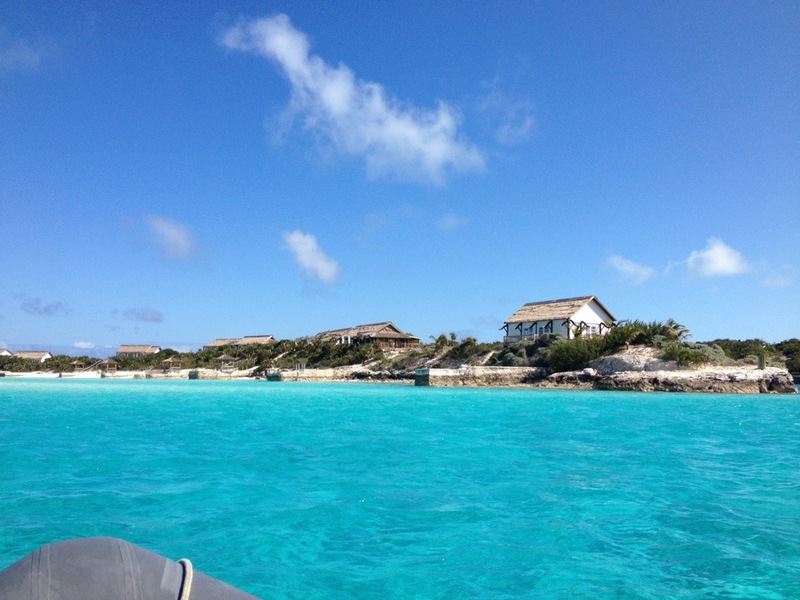 Finally crossing to the Exumas! 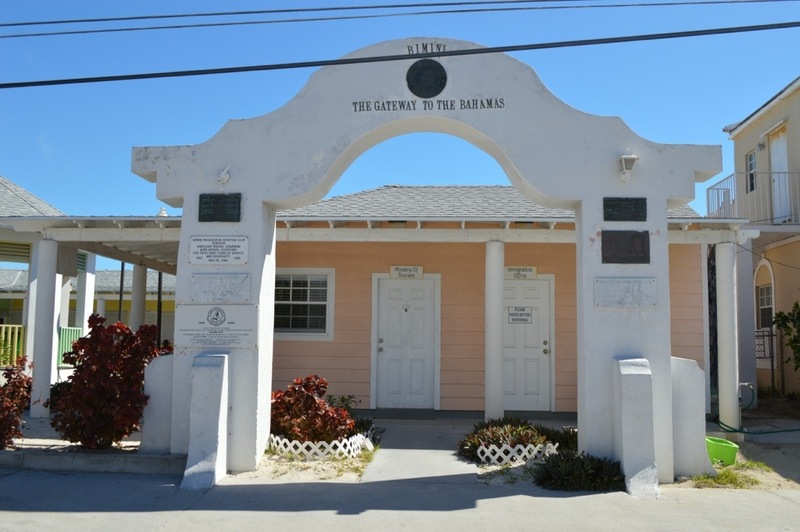 Sail plan to the Exumas. Remains of Lehder’s DC-6. You are seeing the top of the fuselage, under water is the wings, engines and both props. 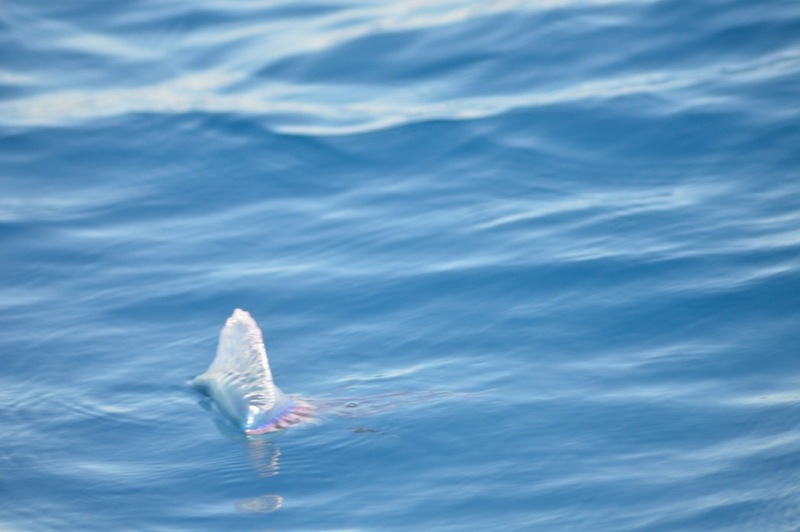 When Adrien dove the site he saw a large Manta Ray relaxing under the wing. 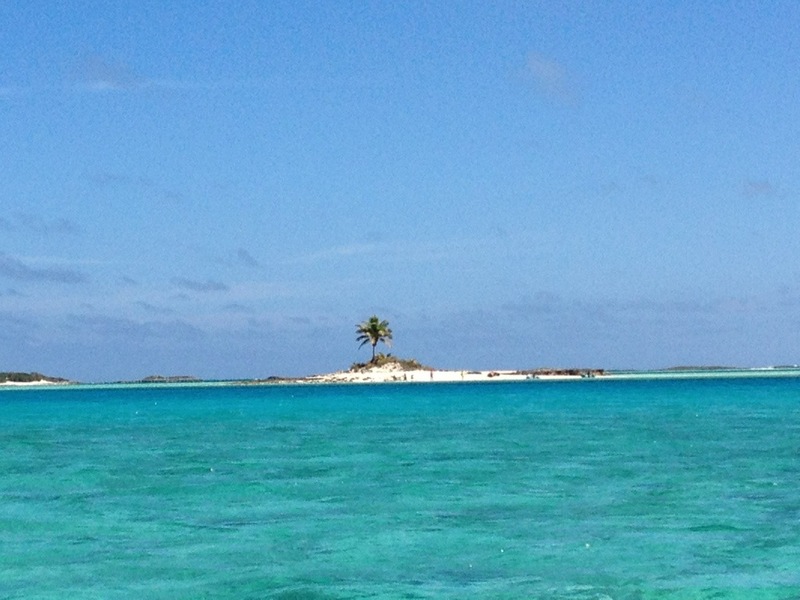 Approaching Wax Cay. 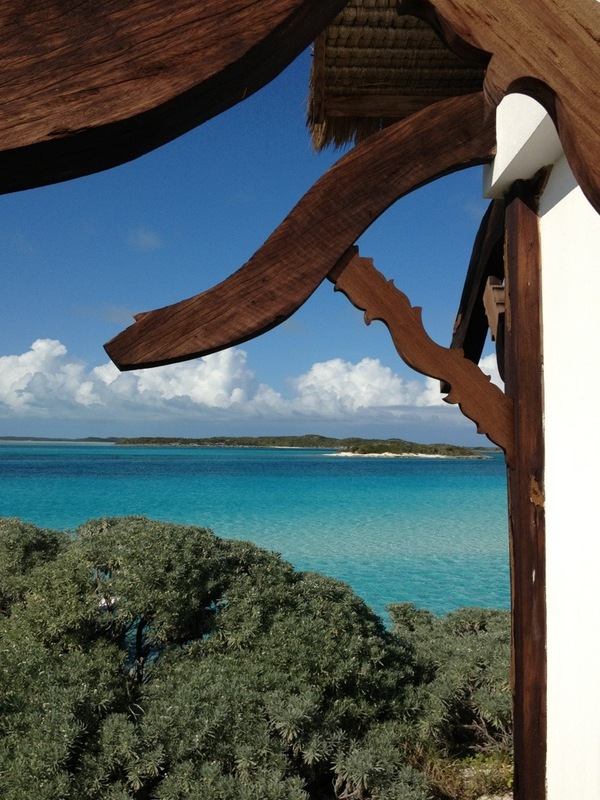 Each of these villas has their own private gazebo and beach! 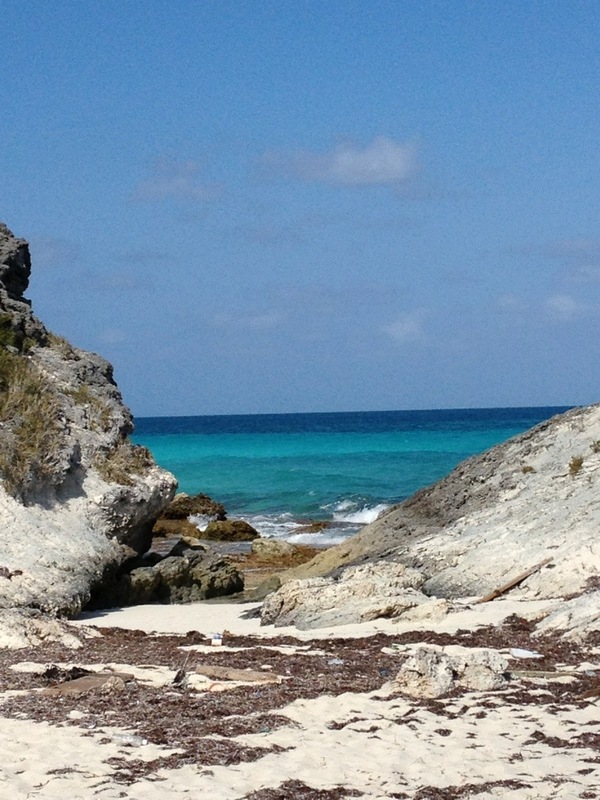 Each beach is divided by a manmade coral stone wall. 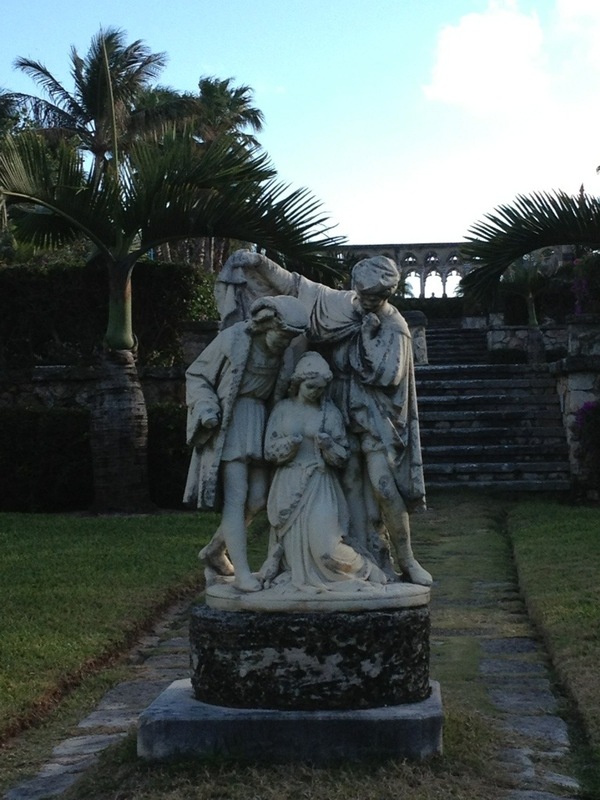 Each villa was a unique sculpture. 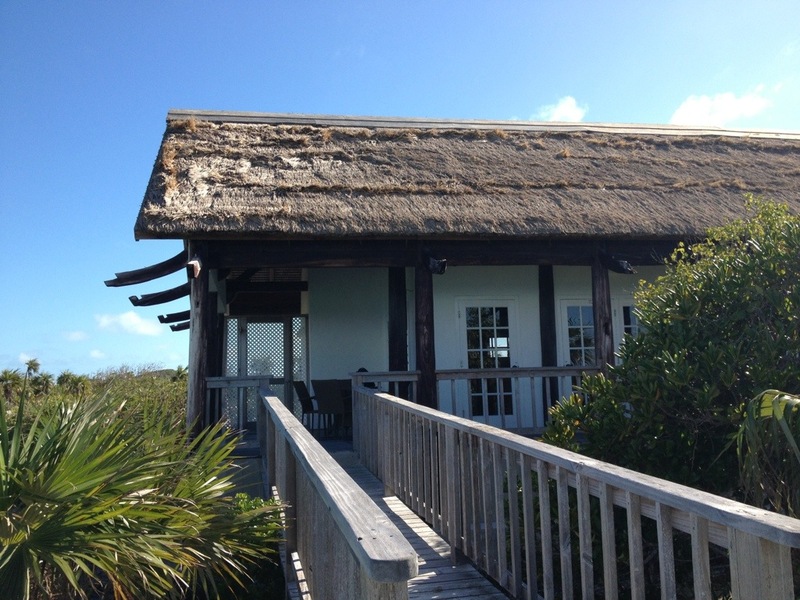 Thatched roofs are replace every 5 years with thatching brought in from Bali. Nina is not always behind the Camera! 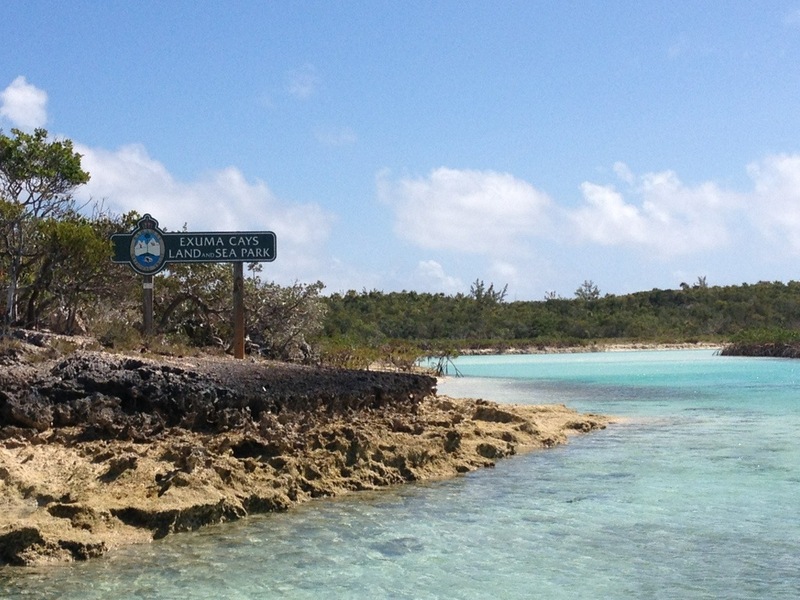 Our 4 mile route to Shoud Cay took us through several cuts between islands. These areas were pretty rough with chop from conflicting currents and winds. It was a wet ride! Then there were areas of shallow water. Adrien had to get out and walk the dinghy til the water got deeper. I felt like Cleopatra on the Nile! 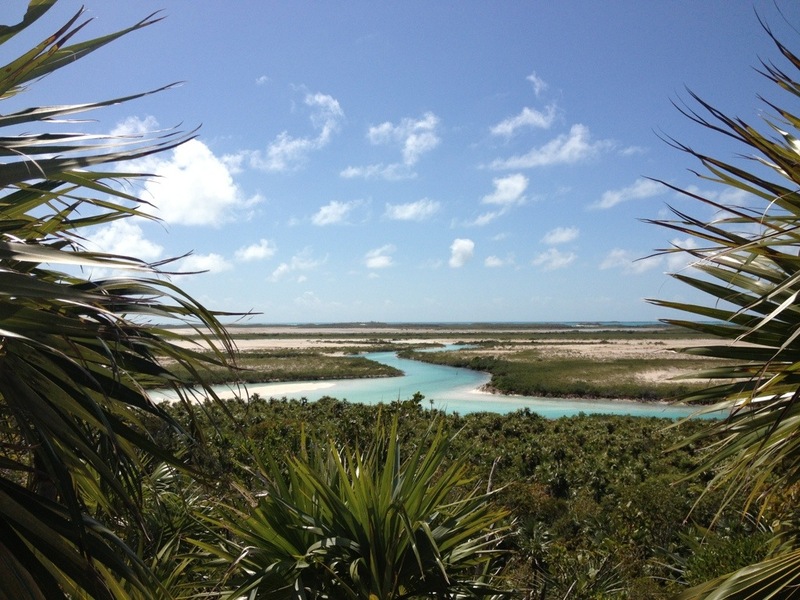 North River on Shroud also marks the northern most boarder of the Exumas Land and Sea Park. Will tell you more about the park in our next post. The North River is one of three rivers to explore. 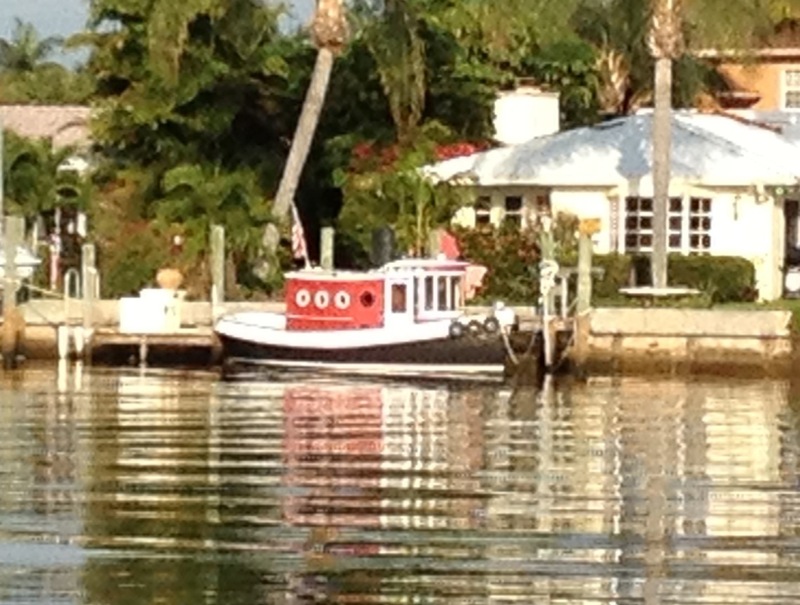 This is the only one that allows a motorized boat. 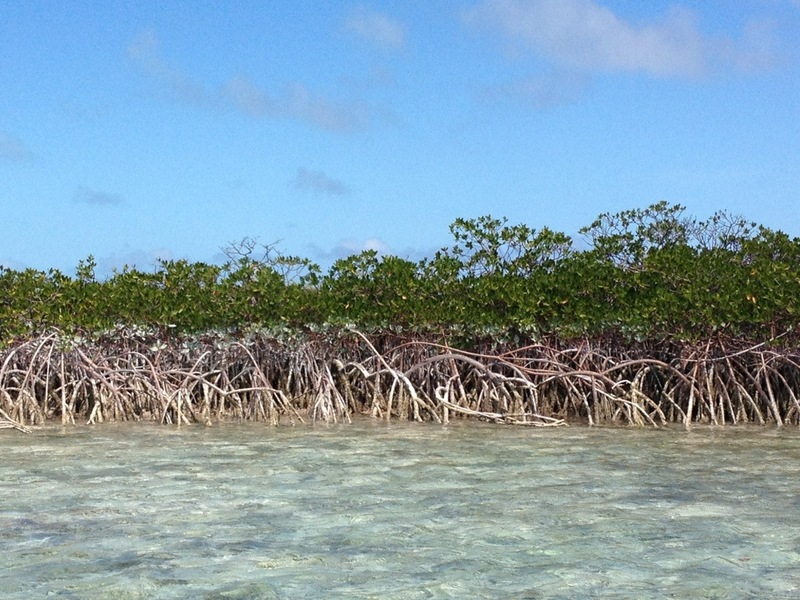 The river is only a few feet deep, in some areas just a few inches deep at low tide, lined on both sides by Mangroves. What a peaceful ride thru the Mangroves! At times we had to lift the motor and row…it was so quiet we could hear the birds sing! 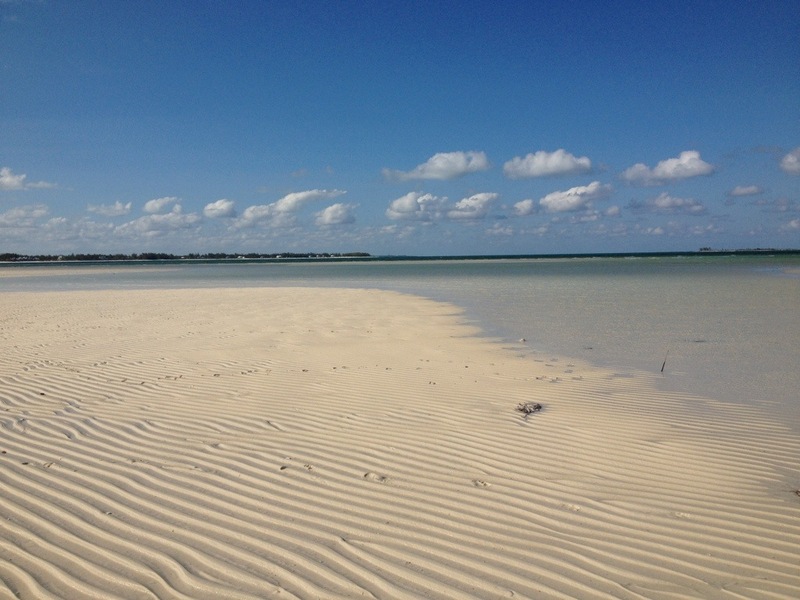 The mile long river opens to a beautiful beach on the east side of the island. With the Eastern exposure there was some floatsom. 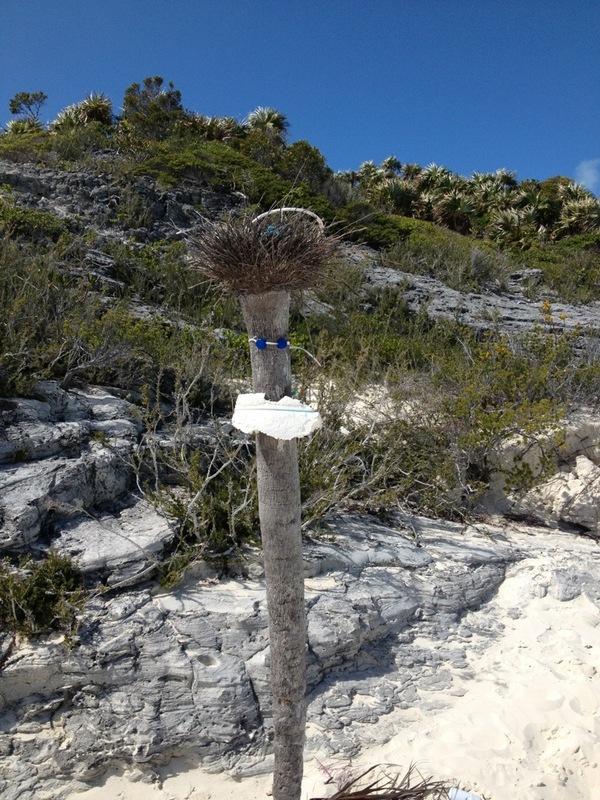 Previous cruisers collected the debris and created these creative beach totems! There was a rocky path up a hill we took to get these two shots. This is looking back at the river. After a stroll on this beautiful white sandy beach with delightfully fine soft sand we did a bit of snorkeling and started the ride back to Dolphin. Cute little curly tailed lizards. 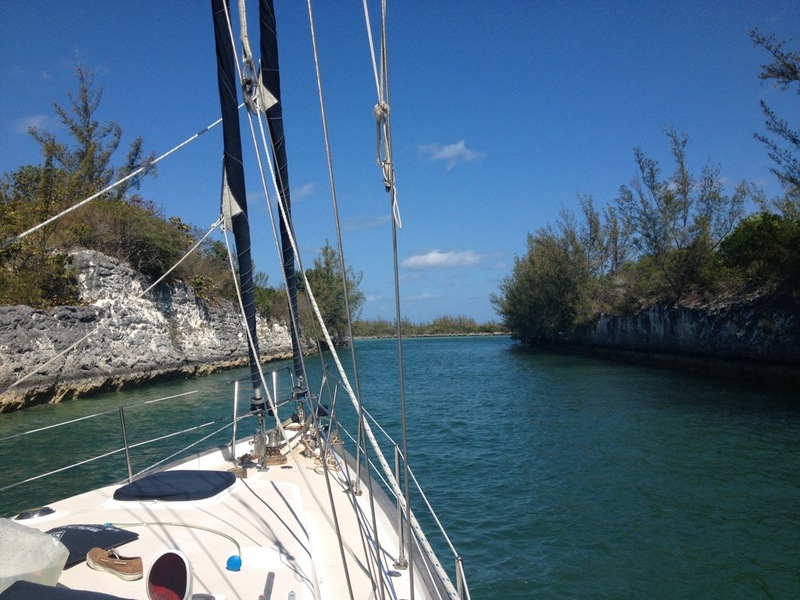 We got back to Dolphin just in time to close the hatches and port lights! She enjoyed a well deserved shower!! 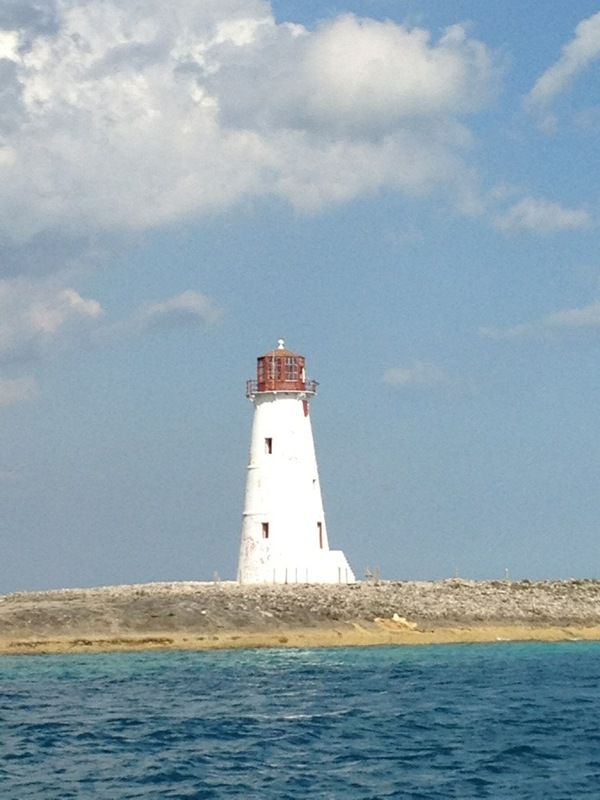 With an expected Cold Front and predicted high winds we left at 07:30 and high tailed it to Nassau to find protection. It began as an uncomfortable ride into high swells and short chop but settled down by noon. 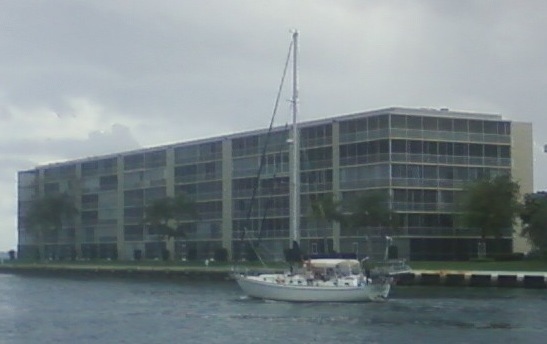 We arrived at the outer Harbor and “called in” to Nassau Harbor Control to ask for permission to “enter” Nassau Hrbr. It was a slow process but we were finally given permission to enter. As we were about to pass under the first Bridge we were following a 50 ft S/V and witnessed the top of their Mast hit the bottom of the Bridge !!!! They looked dumbfounded as the bow of their vessel was picked up and the stern nearly went underwater !!! We passed them as they were looking up at the top of their mast looking for damage! 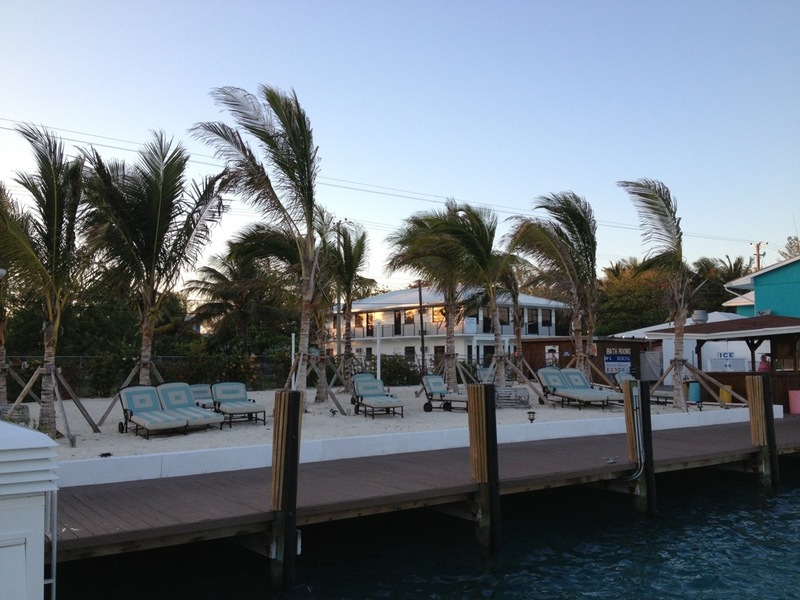 We arrived at Paradise Is Resort Marina, with S/V Nemo and S/V Hug. By the time we tying up it was a “rocking and rolling” late aft and evening due to passing large boats. Nina caught up with the team at TRC as she walked the dock. 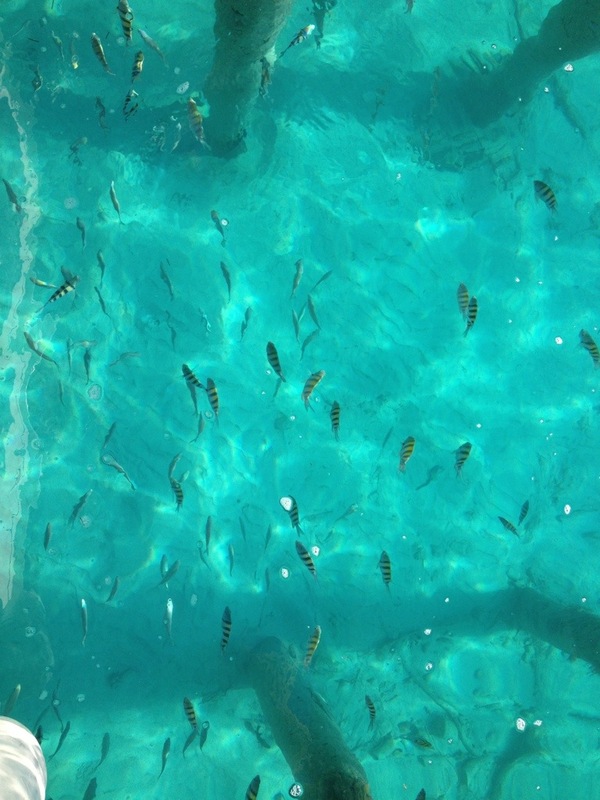 It was a treat to see many Leopard and Manta Rays up close in 4-5′ of water. At $2./ft the cold showers, no water in the swimming pool, closed restaurant and much construction going on did not endear us to this facility. We decIded early the next morning to leave and find a more accommodating Marina, but not before The Admiral put her negotiating skills to work and got our ( and 3 other boats) fee reduced to $1.50/ft. Nice going! 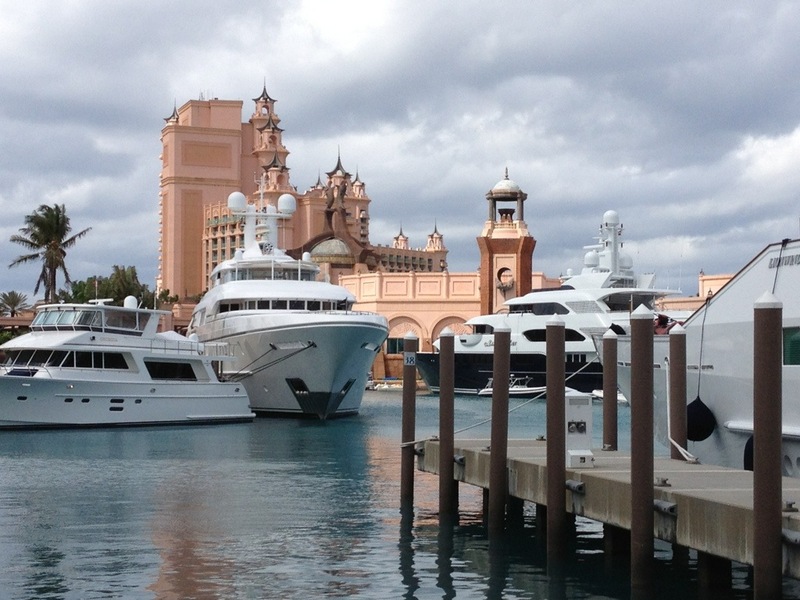 We arrived and settled into Nassau Yacht Basin by noon. 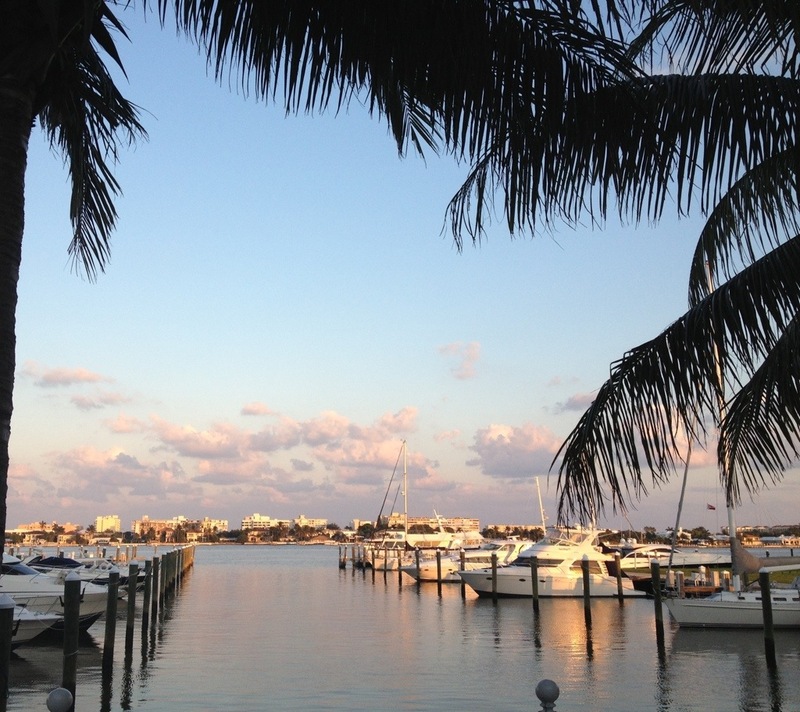 It was not our first choice for a marina but the reservation we had at Nassau Harbor Club could not be honored because boaters that had planned on leaving stayed on to hold for the storm. The harbor had filed up quickly as the cold front arrived sooner than originally predicted. NYB offered hot showers, fairly clean bathroom and laundry room facilities, a nice restaurant, and walking distance to stores and markets to reprovision, it worked for us! As the cold front came through it was great to be able to walk around town, but note to self, having a dock reservation doesn’t mean much when a front is coming it….get there early!! 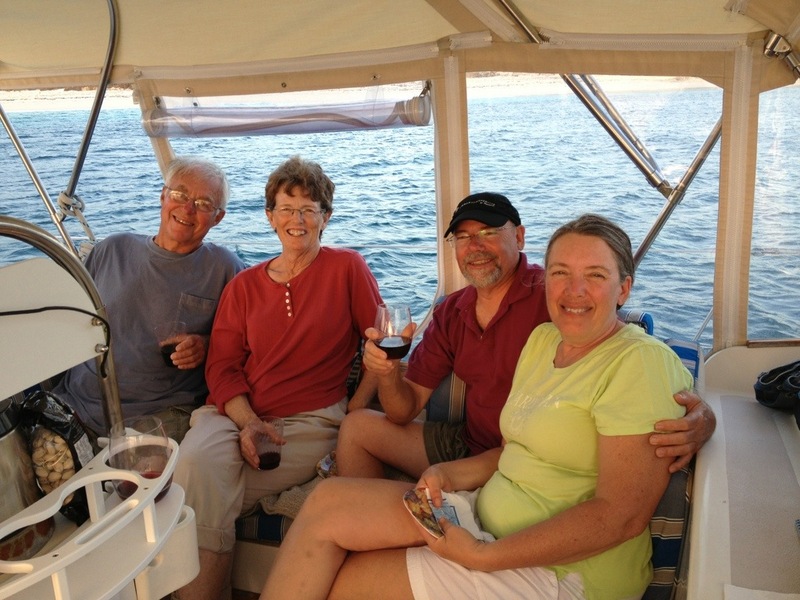 We met up with S/V’s “My Pleasure”, “Bob Ra Ann” who we had met at River Dunes in NC and “Que Sera Sera” who we met in Brunswick. Lots of great Happy Hours, dinner at the Poop Deck and a BDay celebrations on “Hug” with champagne and delicious local Rum Cake! 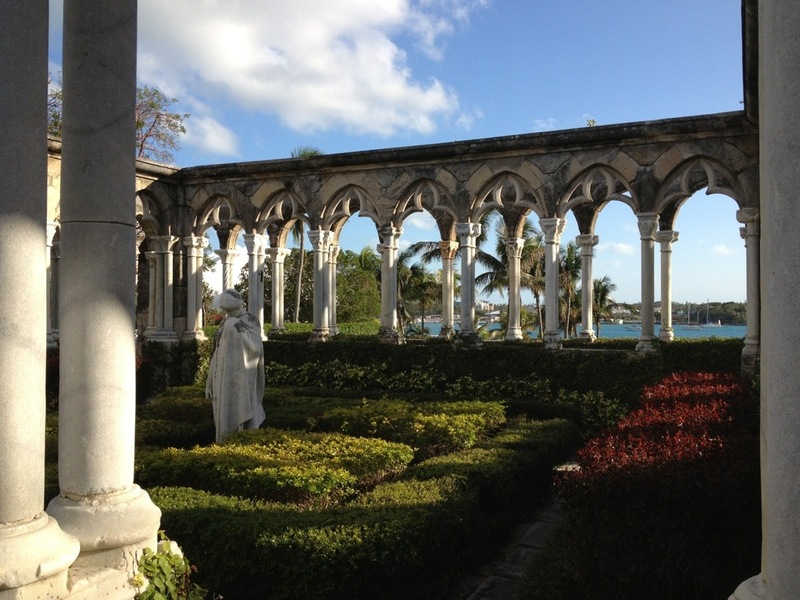 An all day walk took us over the Bridge to Paradise Island, a tour of Atlantis Marina/Hotel with more Mega Yachts and the Cloister and Versailles Garden. 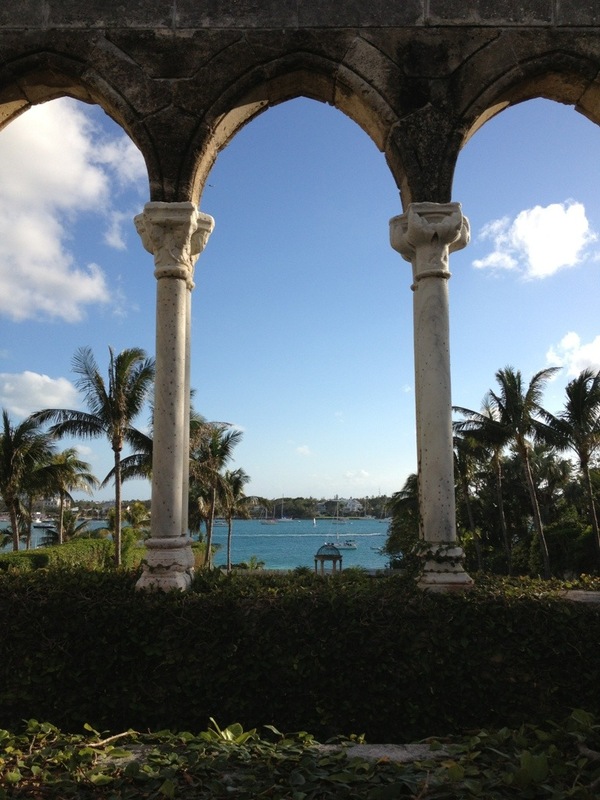 Under the bridge that links to Paradise Island is an interesting sight and experience. 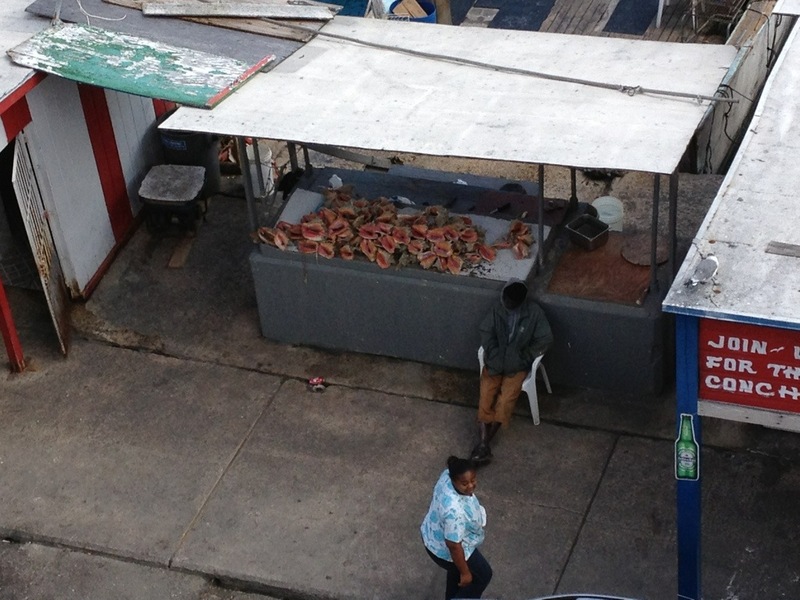 It’s the hangout for local fishermen to sell conch and fish, stands selling fresh produce, and locals drinking and playing table slapping Domino’s. We didn’t venture to any of the food joints but Nina purchases produce (plantains, peppers, onions, limes, hot peppers, fresh thyme and ginger), and cleaned conch for to make her first ceviche..which was delicious! In all, we spend 5 nights in Nassua. The days flew by with laundry, shopping, house cleaning and cooking filling our days. When it was time to move on we were in the company of many other boats departing. 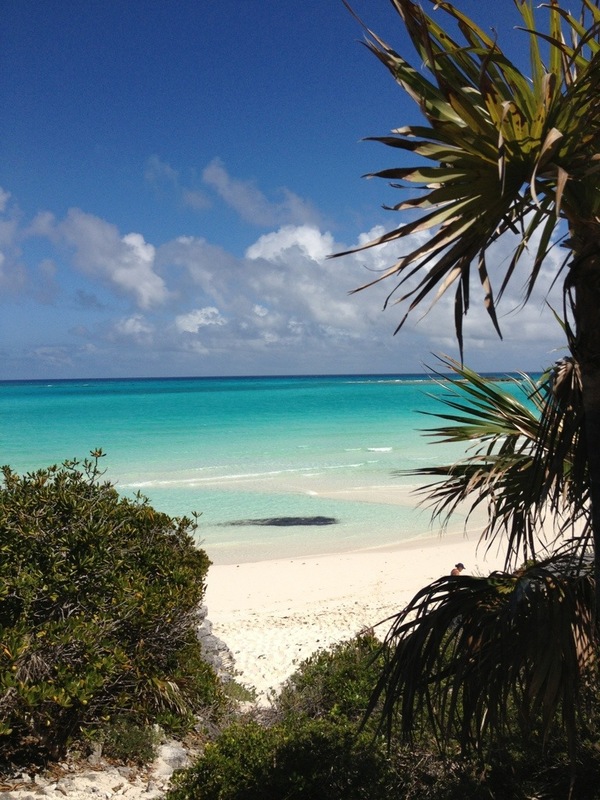 Next stop, Exumas! 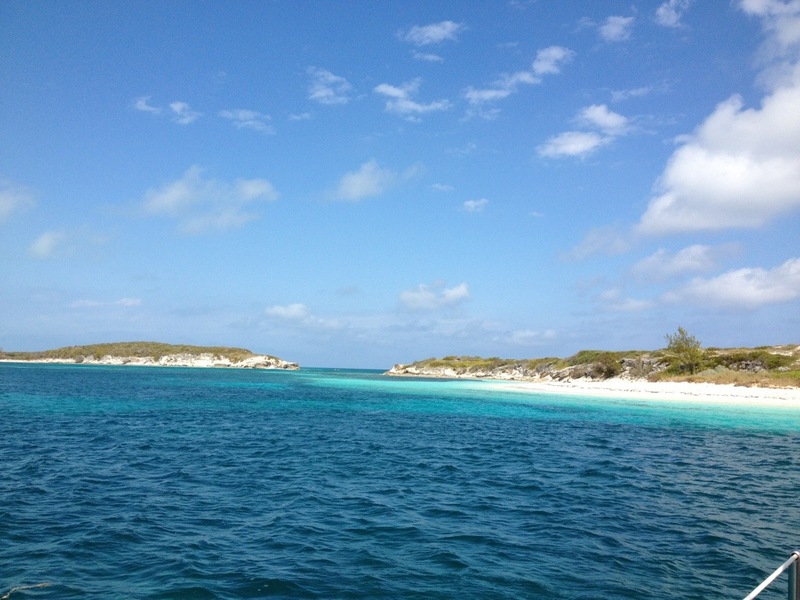 We had intended to head to Allen Cay but with so many others going in the same direction we decided to head to Norman Cay. 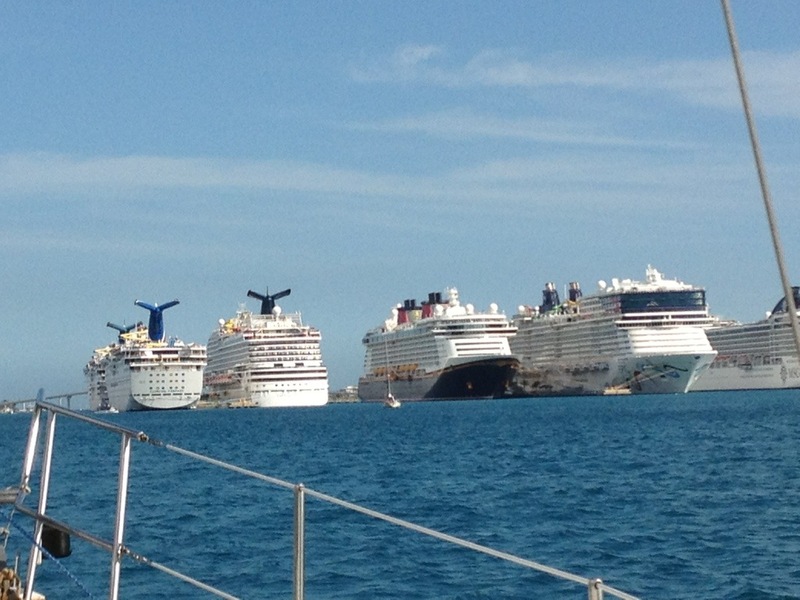 An abundance of cruise ships, dwarfs Dolphin! 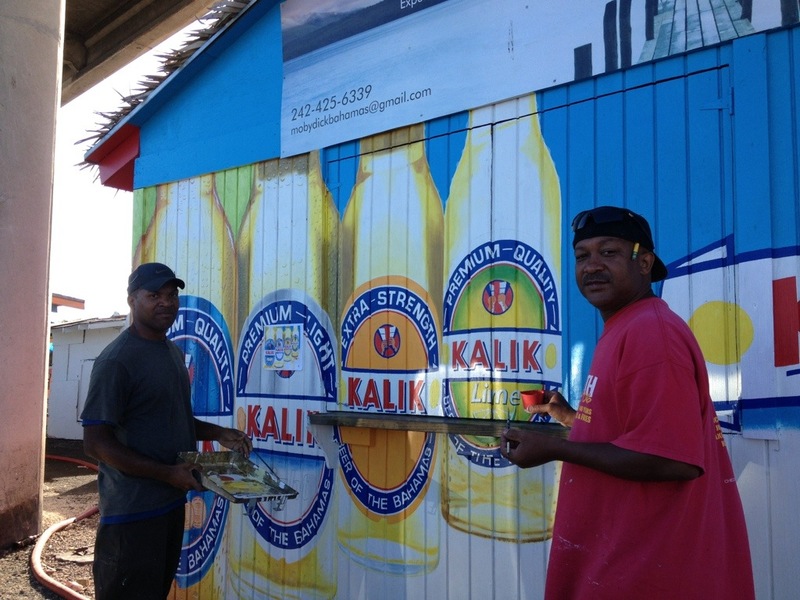 Kalik, the local beer. These guys did a nice job painting the banner. Panoramic view of the East entrance of the harbor from the top of the bridge. 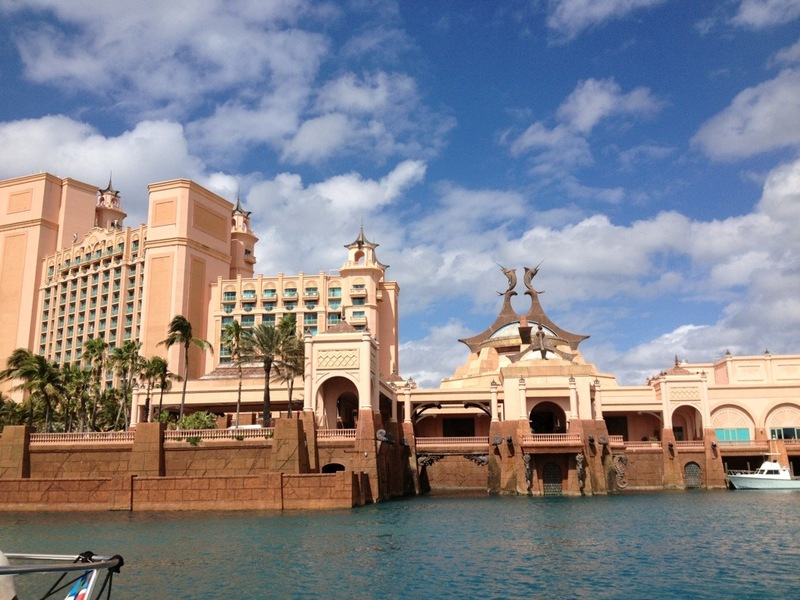 The Lagoon at Atlantis. This was the only thing we could see with out a $125./day pass! 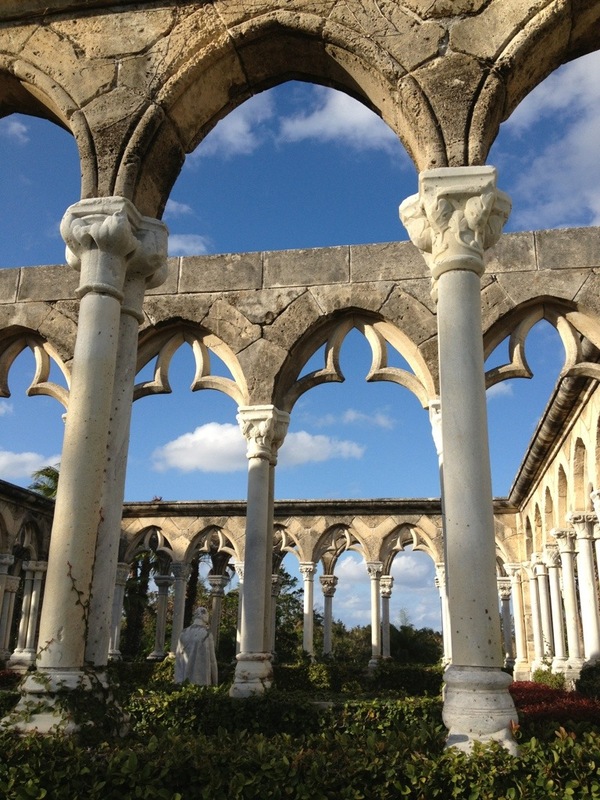 <br /The next few shots are of Versailles Gardens and The Cloisters, a beautiful spot for a wedding! 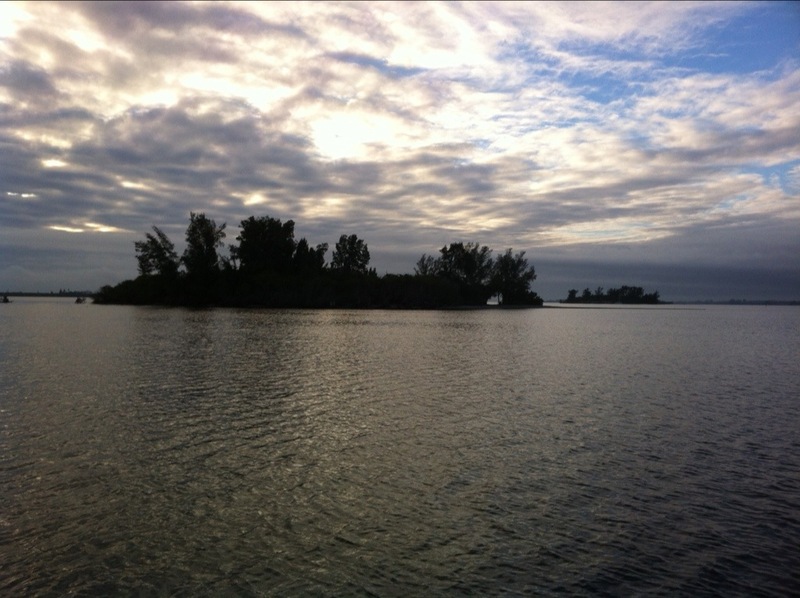 We left at first light with Nancy Lu to Great Harbour on the North Berry Islands. We were able to sail for about 3 hours on this 16 hour trip. We arrived and anchored on the Bank 7 nautical miles from the Harbour at 23:00 hrs just outside the channel in 17 ft of water , to wait for daylight and high tide to cross shallow water to arrive at our final anchorage at Bullocks Harbour. After anchoring just off the channel Sue graciously offered to take the first anchor watch; and, her IPad served as a worthy companion to pass the time! Nina took over at 02:00 – 4:30 then Adrien decided we didn’t need to do an anchor watch! Shortly after first light we weighted anchor and went into the harbor anchoring at 07:00… then we took naps!! We dink’d in to Great Harbour and took a walk to the Airport, had lunch at the Tiki Hut across the street, then enjoyed a 3 mile walk along the gorgeous Hawks Nest Beach, picking shells, sand dollars and sea biskets. We also found a sea cucumber and watched it lay eggs. Back to Dolphin for relaxing cocktails and a beautiful sunset, then a delicious dinner. 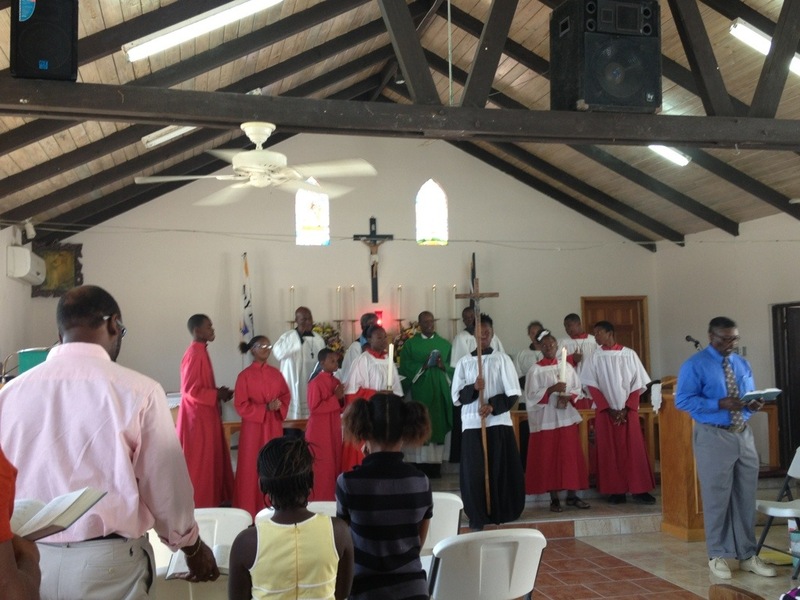 Sunday we dink’d into Bullock Harbour and attended 11am Service at St Bartholomew Church. As we were singing the first of many Hymns, we noticed Dolphin sitting at her anchor out in the open bay. Sue took a photo, but complained about the red trash barrel in the foreground. Almost as if Dolphin heard the complaint, she soon started moving away from the barrel. Very soon she moved to the next window!!!! She was drifting!!! Now Nina and I had to make our excuses and leave the Service to rescue our retreating vessel . We rushed to the dinghy and raced out at full speed, climbed aboard , started the engine, retrieved the sliding anchor and motored into Great Harbour to take our reserved Slip. After securing Dolphin to the dock we waited for a cab, drove back to Bullocks Harbour. Stopped for a few minutes for groceries ( store was about to close) then to the church to pick up Sue. To our surprise, Service was still in process ! So we dismissed the cab, returned to our seats and participated in the remaining 20 minutes of the service! 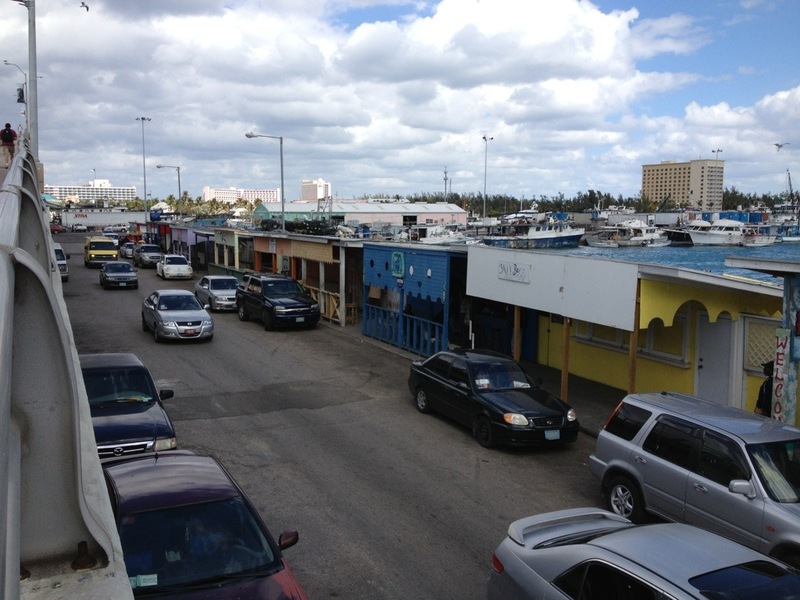 We got a ride back to Dolphin by a parishioner, Élan and his wife Ruth, changed and walked about the Marina dock, watched a gentlemen remove and clean a Conch, then we watched Nina learn to clean a Conch with his sharp fishing knife. Those suckers are slimy and slippery; thankfully she still has all her fingers! 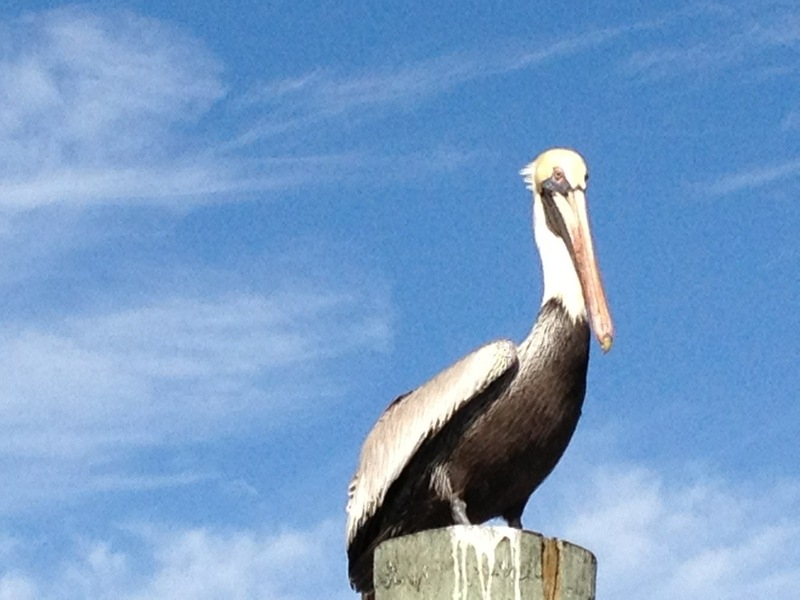 Shortly thereafter a Happy Hour started on the dock. 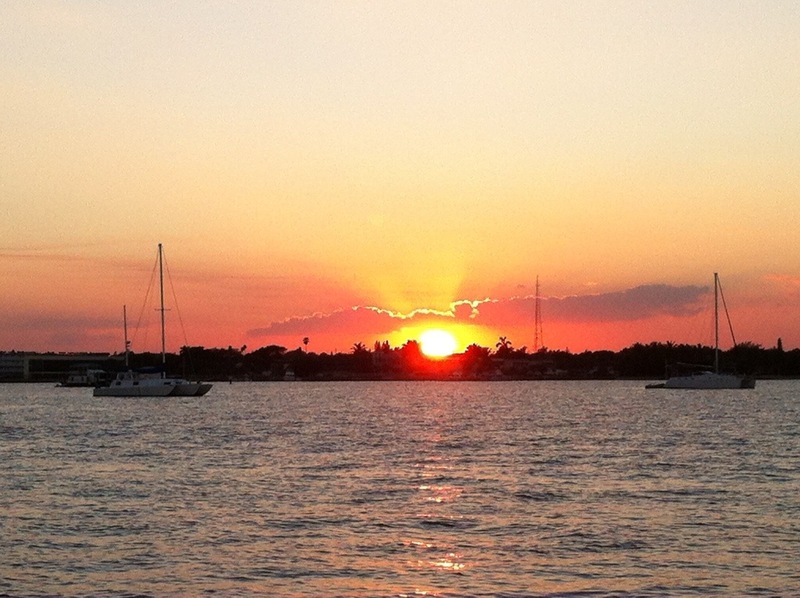 It’s great to meet up with other boaters at this most relaxing time of day! Too tired to cook we took a very short walk to Rocky Hill Restaurant for a delicious dinner of cracked conch, fried and sautéed fish. Thanks for the treat Sue! As Nemo fizzled out up North Sue decided she could delay her departure no longer. She grabbed a cab for an early morning flight to Nassau, then to BOS. It was sad to bid farewell. 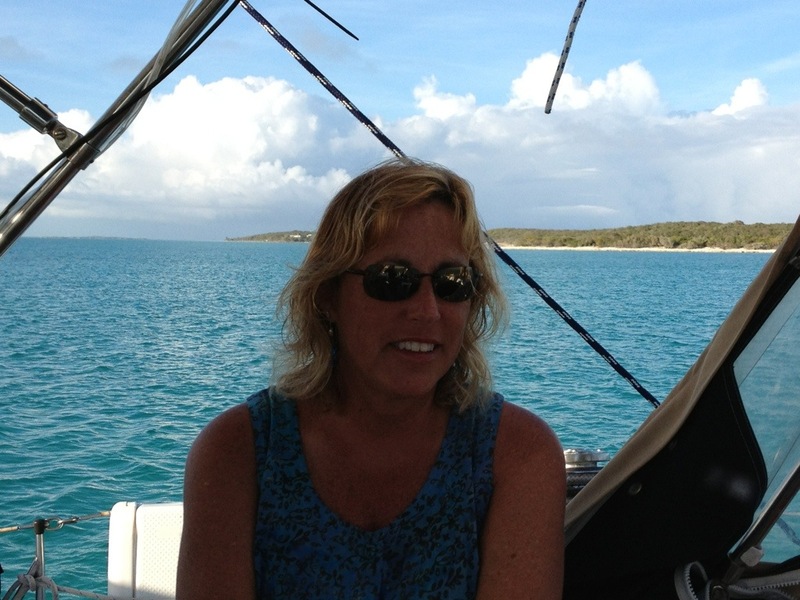 Sue is a fantastic First Mate, and great companion! After she left we had some breakfast, made small talk on the dock, and watched 2 Manatees hovering several slips away from us. Adrien enjoyed serving them fresh water ! Wow, what a great time seeing them rollover on their backs relishing the dripping fresh water! 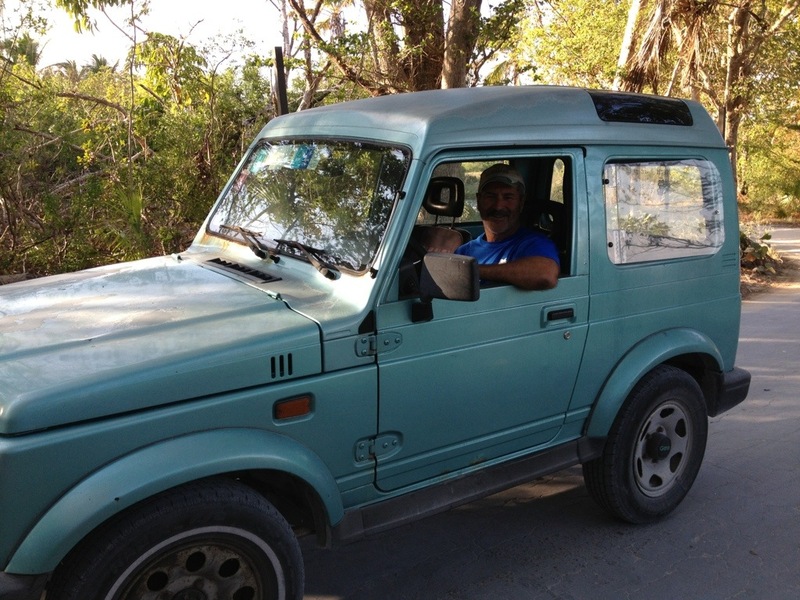 We rented a small, decrepit Suzuki Jeep and explored the Island with Mark and Timmy(Dashound) from NancyLu. 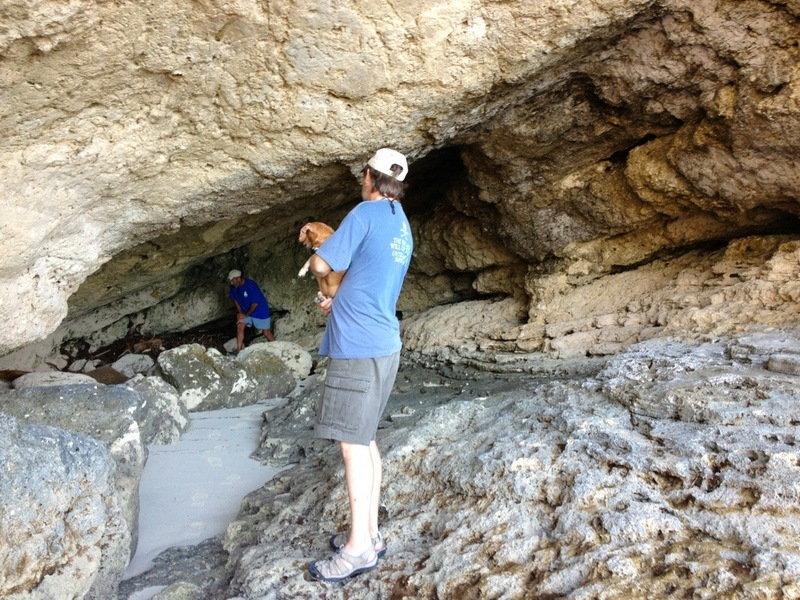 We visited the remains of the Rat Pack Resort and enjoyed a strong blow and beautiful view from the vista, explored a cave on the eastern rocky shore, and some beautiful beaches. 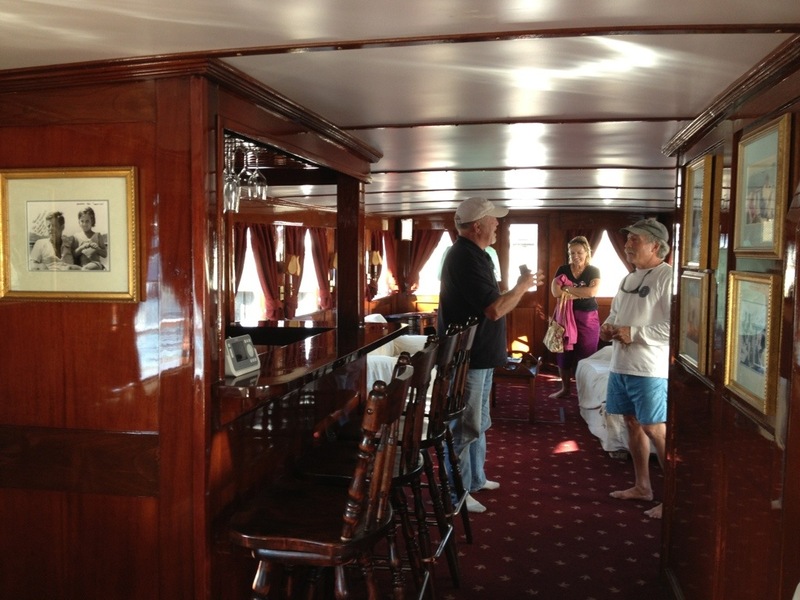 Back to the Dock and we were invited by the crew of Sea Bear( Jack Nicklaus’ MegaYacht) for Dark and Stormy’s. After chatting with more Dock Mates and locals, we retired to Dolphin for a lite dinner and a relaxing evening drafting the Blog together . 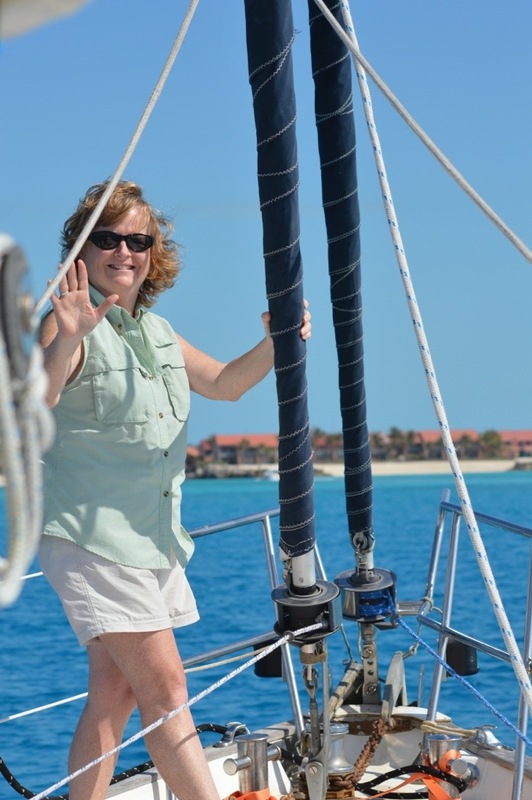 We refueled, filled the water tanks and left the dock at 08:30, met up with Nancy Lu at their outside anchorage and motored north around Stirrup Cay, close by some parasailors and a large cruise ship then motorsailed to SoldierCay. 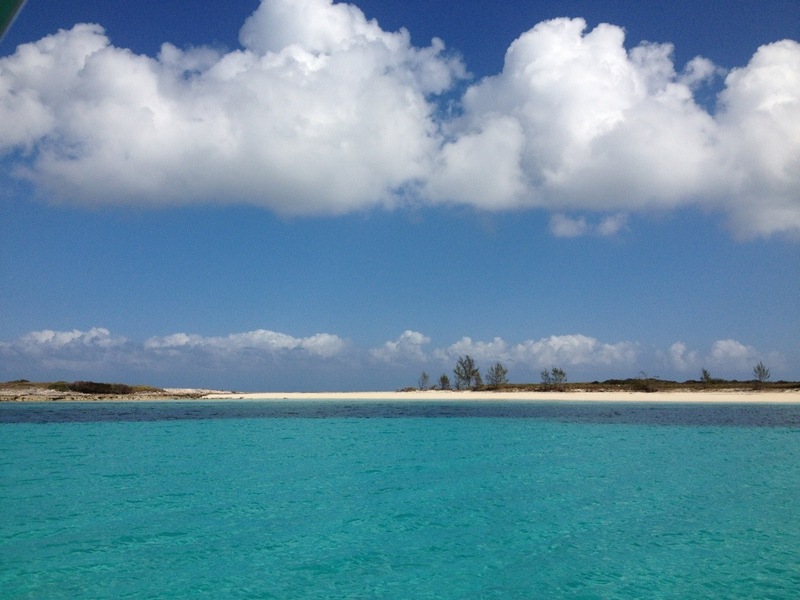 We anchored close to a beautiful beach and spent the afternoon exploring and snorkeling. 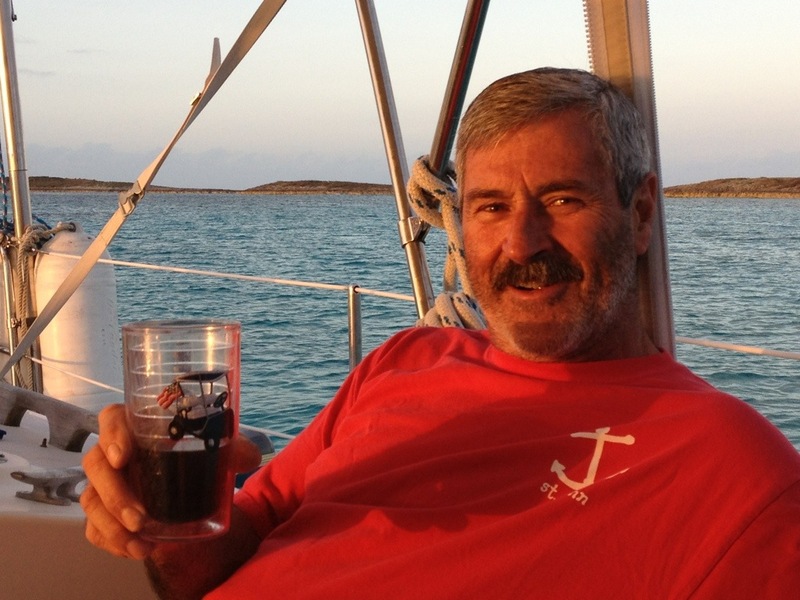 The next day we did more exploring, met up with S/V Nemo ( Don and Judy who we had met at Great Hrbr Marina). 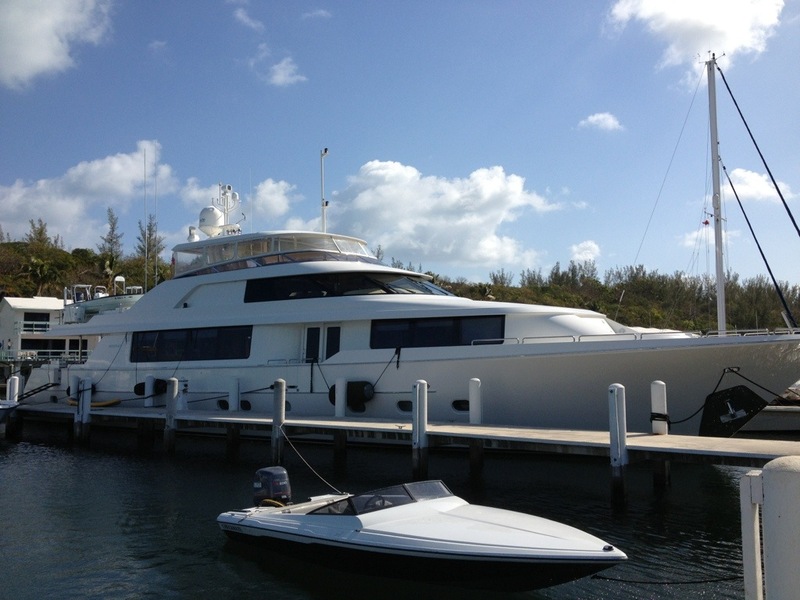 Together with Nemo we left for Hoffman Cay, about 5 miles south. We said goodbye to Nancy Lu as they were headed East to Spanish Wells. 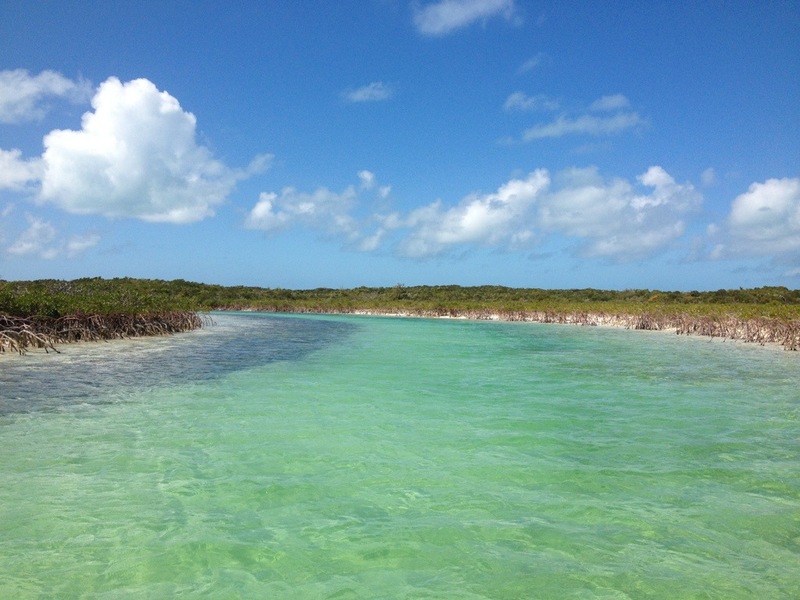 At Hoffman Cay, just a few miles further south we explored a “Blue Hole ” met more interesting boaters and hosted “Happy Hour ” on Dolphin with S/V Hug from Norway and M/V Eider. 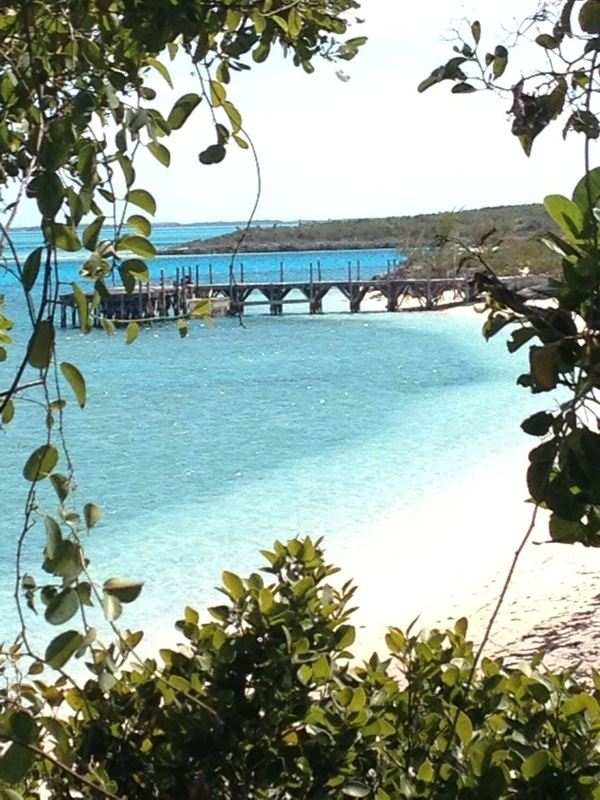 Manmade entrance to Great Harbor Cay Marine, very protected. St Bartholomew’s Church service. The ladies come dressed to the nines! There are two keyboard players and a lead singer, and many hymns played throughout the mass. Everyone sings from the heart with vigor, but it’s hard to hear the melody or the words !! 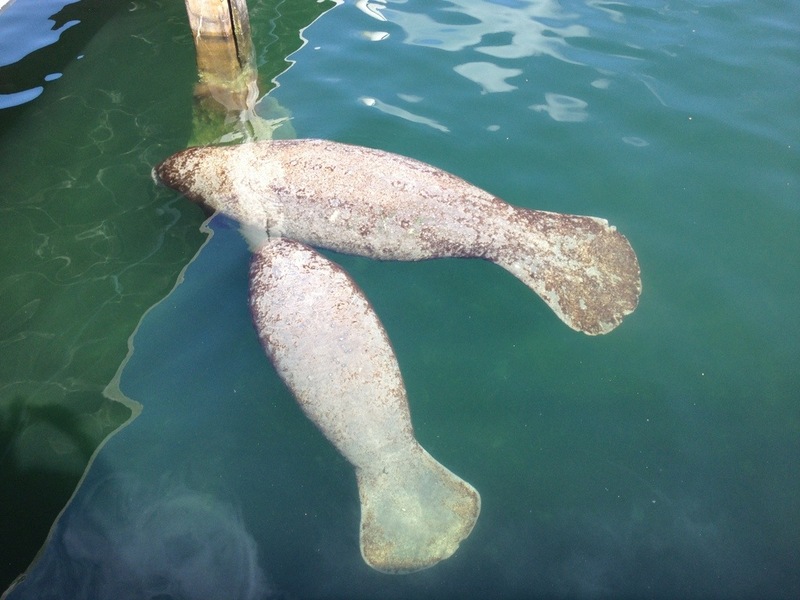 Mom and young Manatee hang around the dock hoping for fresh water! Adrien learned how to open coconuts by smashing the crown of the shell on the concrete. 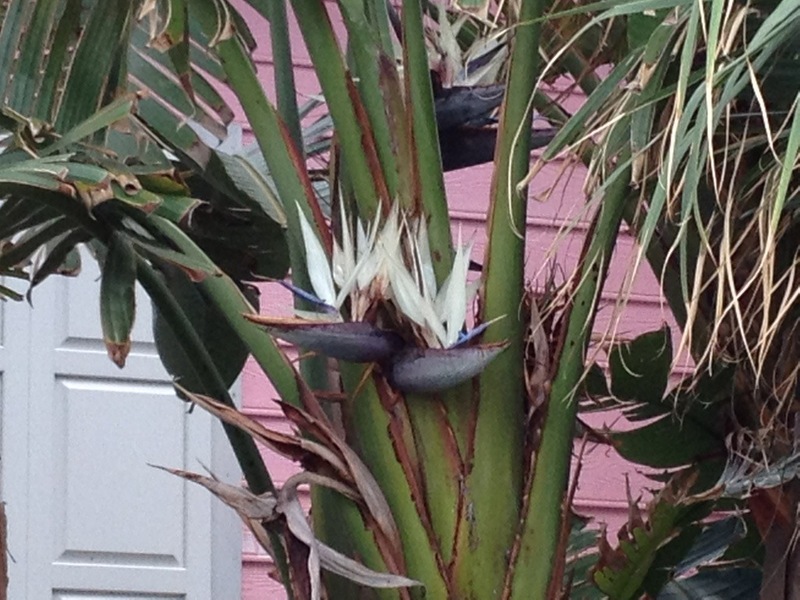 He has a new pastime…. 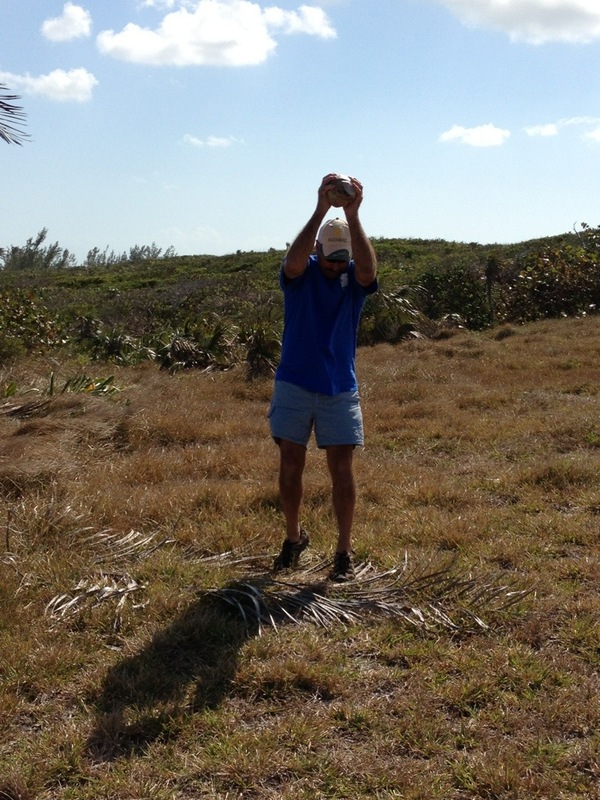 Finding ripe coconuts. He loved the coconut mike for his drinks, I love to crunch on the coconut meat! It’s become part of our daily diet! The shades of blue water are always stunning! 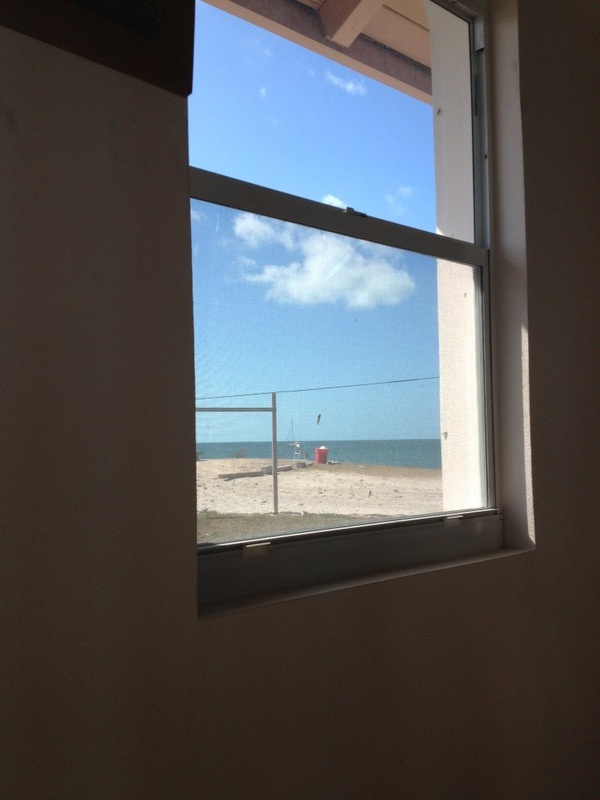 Sue’s picture of Dolphin from Church just before she drifted! She’s just to the left of the red can. 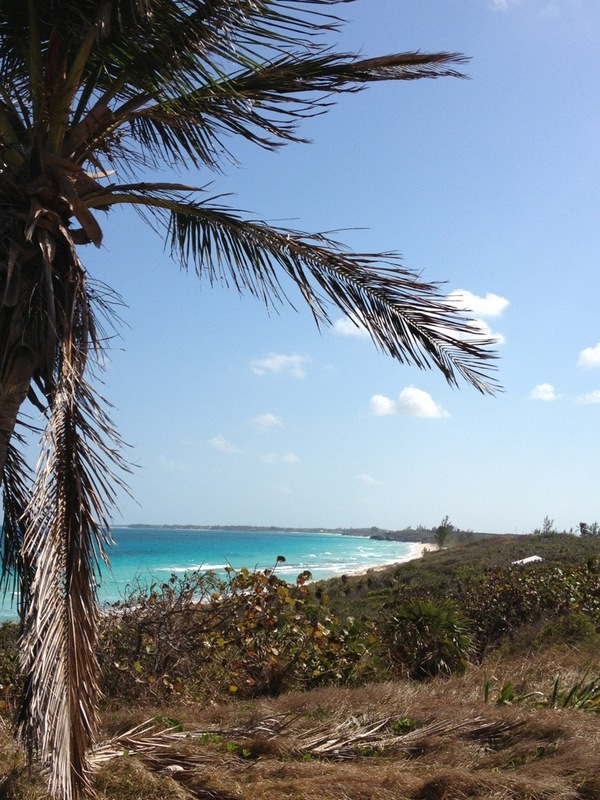 Soldier Cay , A view I would never tire of! 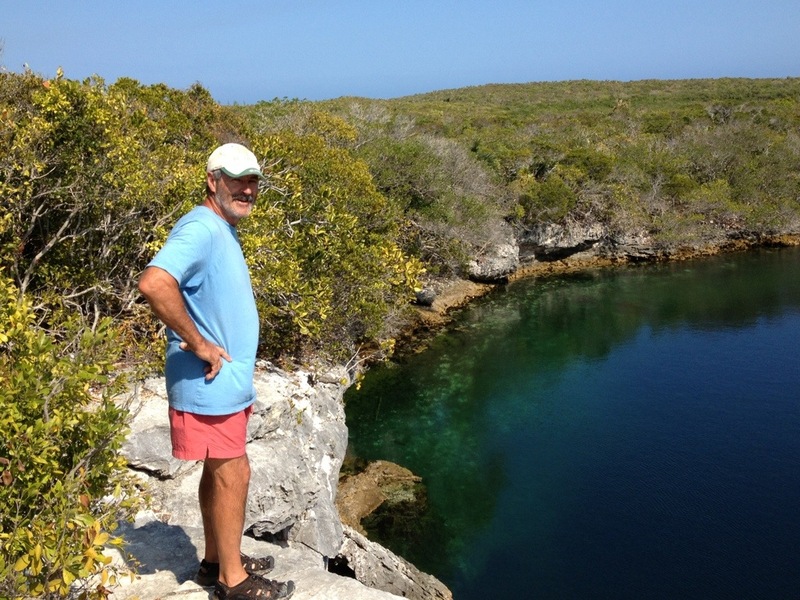 A short walk up hill rocky path led us to the “Blue Hole”. Salt water, it rises and lowers with the tide and houses an abundance of fish. No one knows how deep it is! A Sun Downer on Dolphin with “Nemo”, “Eider” and “Hug” from Norway. Knowing we were now ready to leave at midnight we left the Marina at 4pm, went under the Las Olas Bridge and anchored nearby (why pay for another night at the dock! ), had a great and relaxing dinner and took naps. We left at mid nite for our trek south towards Miami. We timed both Bridge openings perfectly and were soon motoring about 1 mile off shore towards Miami. As we neared the Port Entrance, traffic was getting heavy, we had a Cruise Ship coming at us from 8 o’clock, a large private yacht coming at us from 12 o’clock ( our collision alarm sounded), Freighters and Tankers coming at us from 2 and 3 o’clock, so we turned East towards the Bahamas a little earlier than planned to avoid all this traffic! Once traffic subsided we couldn’t have asked for a more relaxing crossing with a gentle breeze out of the ESE @ 5kts and flat seas. 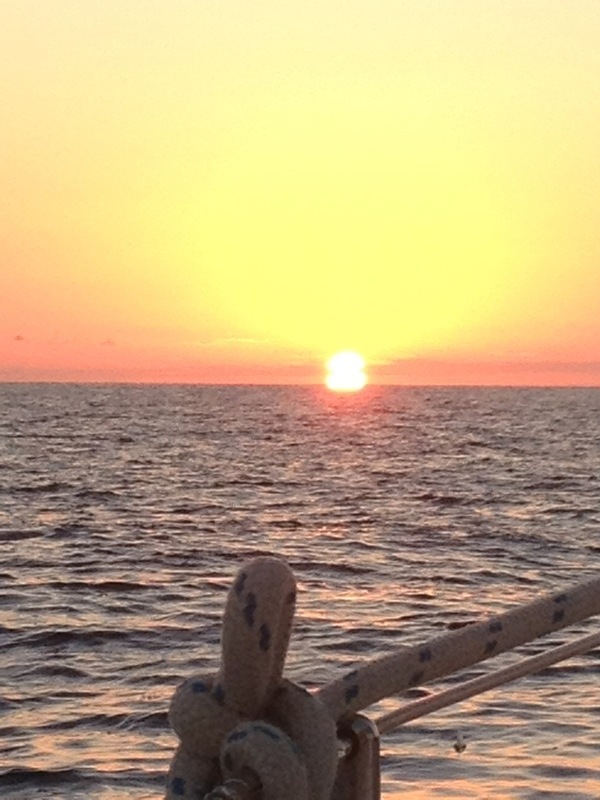 By sunrise the traffic subsided and we had a pleasurable motor sail to Bimini. The inlet was unmarked but NancyLu, who had arrived the previous afternoon road out in their tender and escorted us in. Currents at the inlet are strong but we had the benefit of coming in at a rising tide with currents in our favor.We tied safely into Slip N6at Browns Marina. Within a few minutes the DockMaster presented us with customs/immigration paperwork to fill out. Only the Captain can leave the boat to present our documents and obtain a cruising pass. 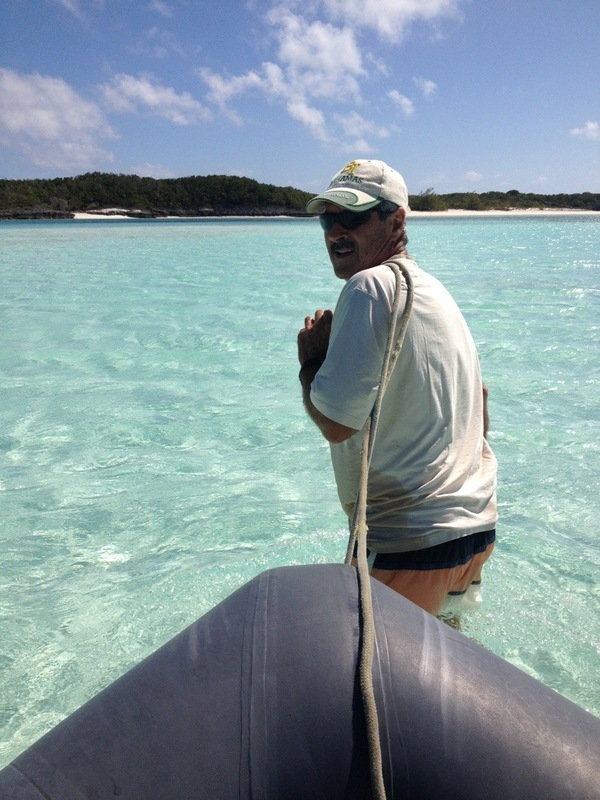 Captain A soon had us cleared with a 120 day pass and we were able to leave Dolphin in short order and visit the Island. We visited and enjoyed the beach on the eastern shore and collected many shells, and an abundance of sea glass and other flotsam. Late that afternoon we joined fellow boaters at the Marina’s comfortable lounge area for cocktails, stories and sharing sail plans. The next day was action packed once we got going! 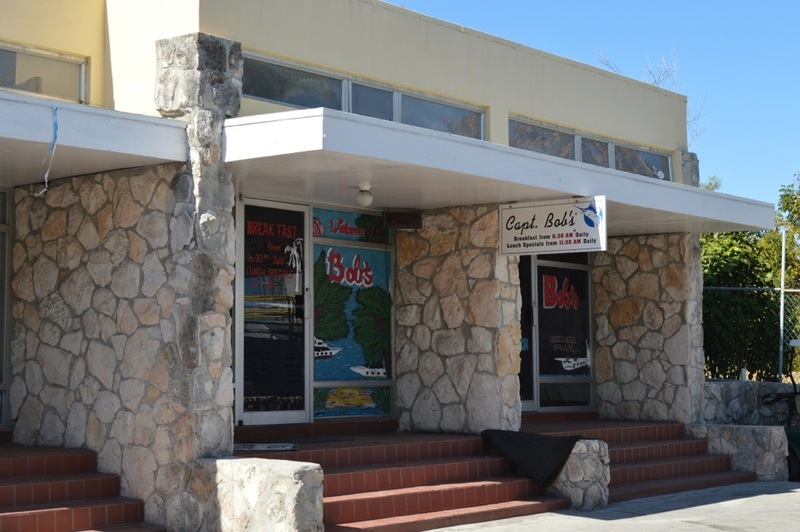 We got lunch at Captain Bob’s and carried it back to the Marina lounge to enjoy. 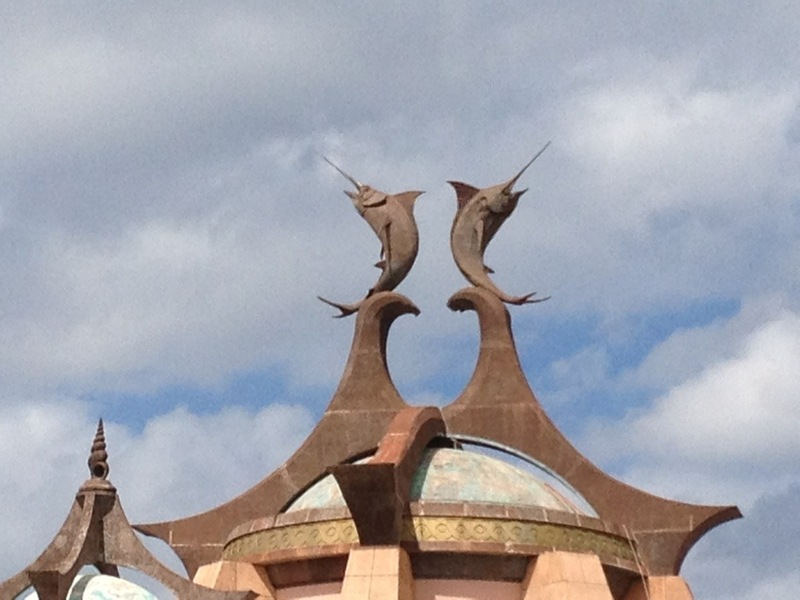 We visited the Dolphin House Museum, a unique home that has been crafted into an overwhelming sight for the eyes. 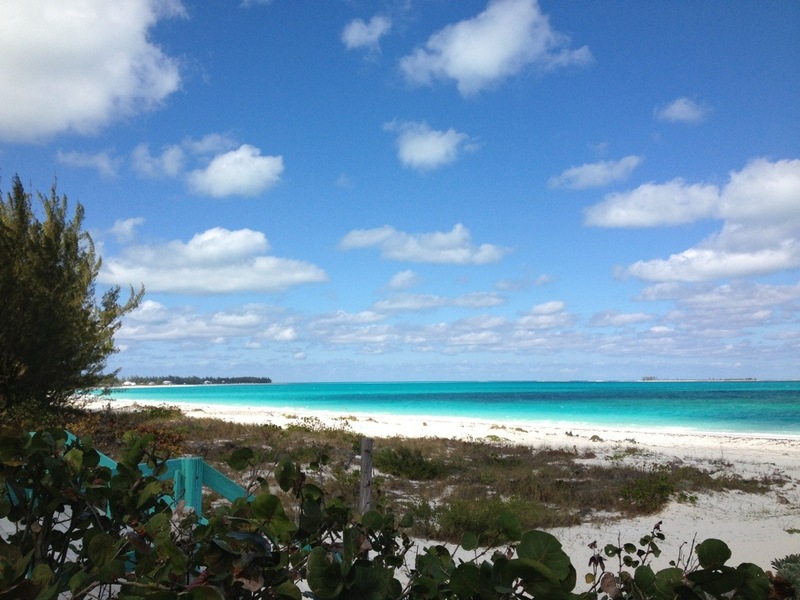 Later we rented a golf cart and visited the entire Island including the completed Bimini Resort Club with breathtaking views, an infinity pool; and, homes under construction that will ultimately make up the Bimini Bay Marina Complex. At sunset many of us met on the East beach to take in the view. Adrien learned to blow a conch! 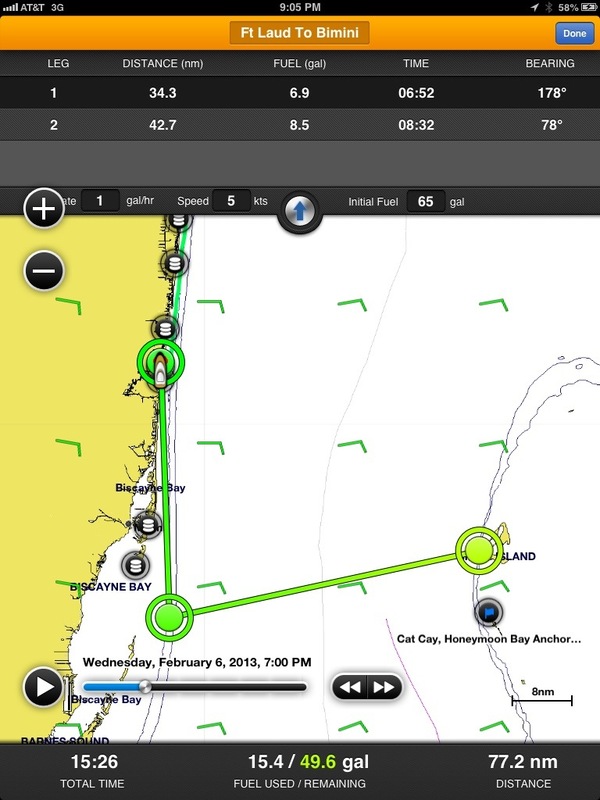 Route from Ft Lauderdale to Bimini, roughly 65 miles. Leaving at midnight allowed us to arrive at Bimini in the morning light to safely navigate the very shallow and poorly marked entrance. 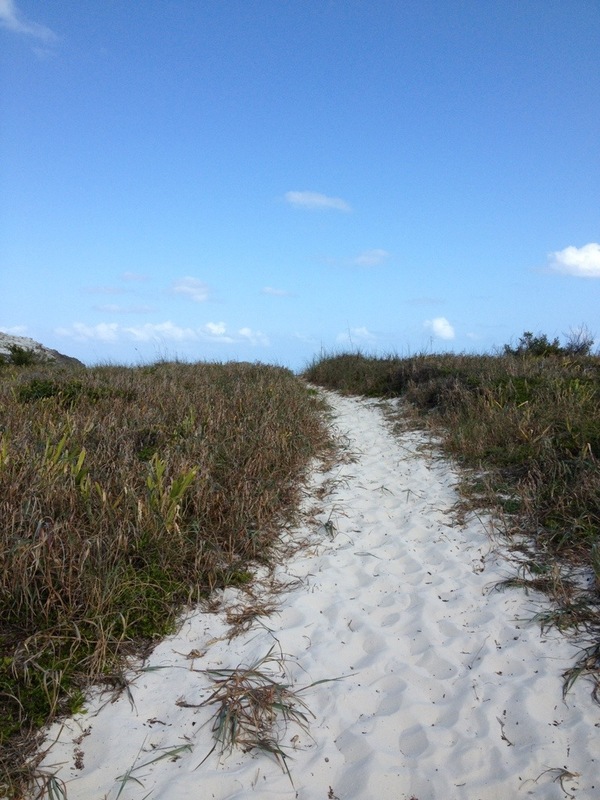 Eastern shore, great beach to collect sea glass! 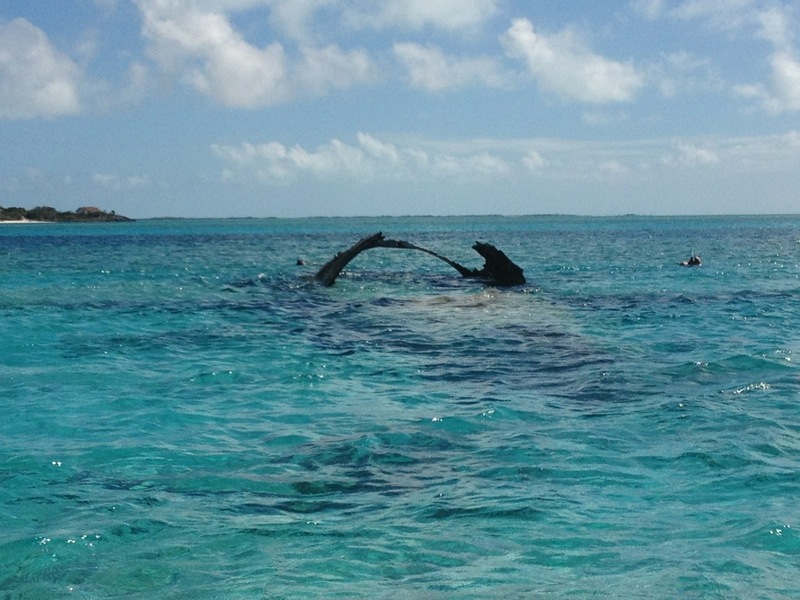 Sue captured this great shot of a Man-O-War as we crossed to Bimini. They put up their sail and let the wind carry them to their next victim!! Customs and Immigration Office, zoom in and notice they want you to knock before entering! The tourist shops. The lady in the car is selling roasted chicken/ brown rice etc out of the trunk of her car to the locals. 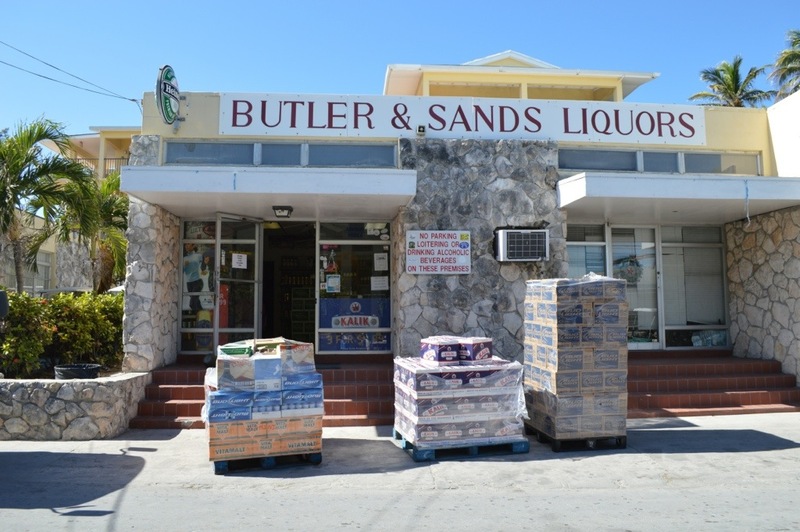 Liquor store, cases of beer start at $48! Inside the Dolphin Museum. The gentlemen in this shot is the owner and craftsmen. Pretty much every material he used came from the island or trinkets he was presented by his many guests. It’s truly been a labor of love that had taken years. 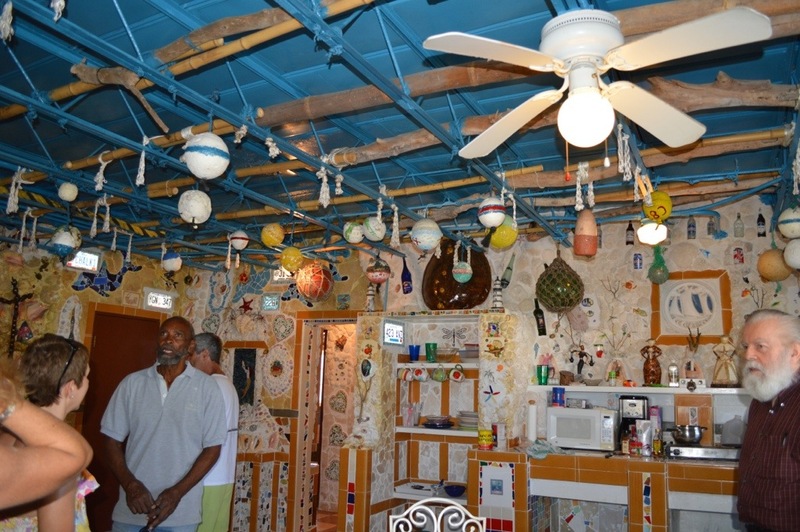 The walls are molded of coral ground cement and mosaics he’s created over time. If you can zoom in you might see a bit of the detail. 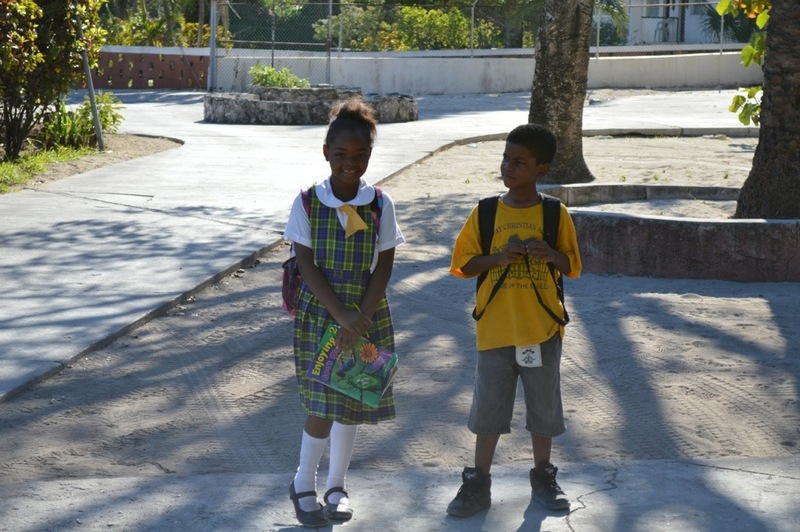 Kids all over the Bahamas wear uniforms to school. 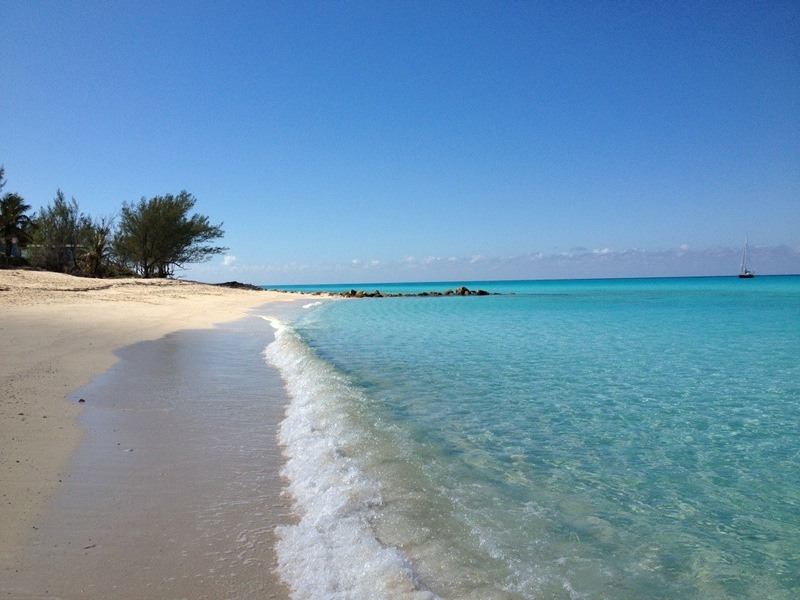 In Bimini it appeared that each grade wore a different color scheme. Thanks for you patience for this very delayed post!!! who drove down from Stuart, Fl. Getting antsy with the wait we decided to take advantage of a NE breeze to head further south to Ft Lauderdale to take for a better position to ” Cross”. We weighed anchor and as we motored out the Inlet we met face to face with 3Tugs coming in the narrow inlet towing dredging pipes into the area. Soon after squeezing past the Tugs we were comfortably sailing on the outside towards Ft Lauderdale, passing many Flying Fish!!!! Prior to entering Port Everglades we experienced starter problems ! With short time and rolling seas we did not have time to replace the starter, so the Capt used a screw driver to jump the starter winding, with the engine running we were good to enter! Soon we passed closely by 5 Cruise ships boarding new passengers for an evening departure, and waited a short time for the 17th St Bridge to open. 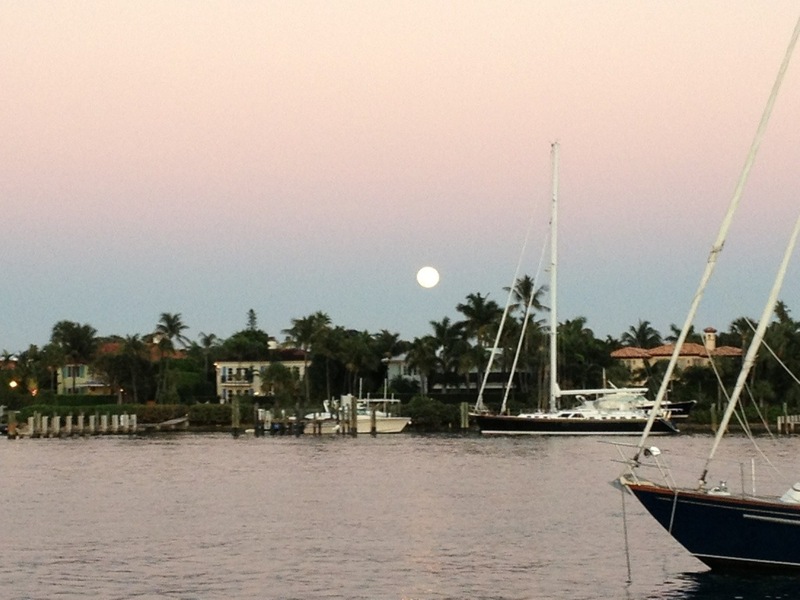 We docked at Los Olas Marina for the night. we arrived just in time to receive Sue, our experienced first Mate. 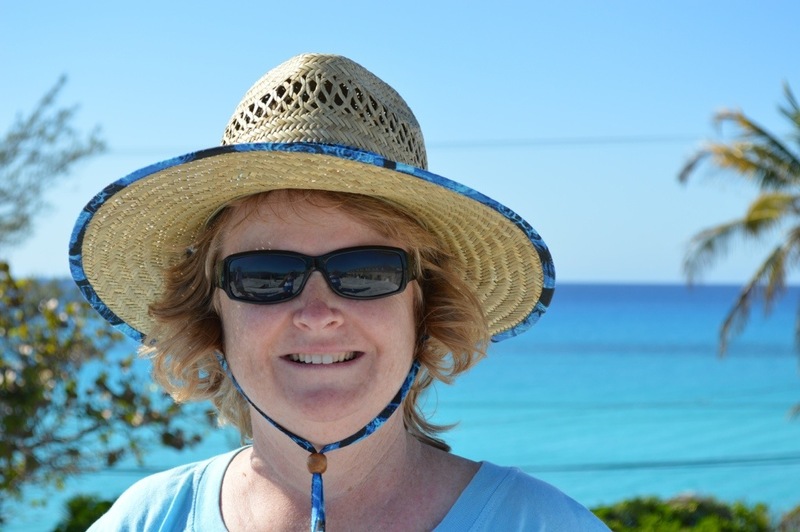 We called her on Friday morning when we learned good weather for a crossing was eminent… By Saturday afternoon she had cleared her schedule, scheduled a one way flight and arrived to board Dolphin! Her return flight was yet to be determined. After a Welcome cocktail went out for a great dinner at Bubba Gumps and walked the “Strip” along the Beach. With all the interesting people watching experiences, we did some shopping, and listened to some great sidewalk musicians, had some frozen yogurt, then back to Dolphin for cocktails and some relaxation. The next day we took a trolley and reprovisioned, yes again, (beer, wine and food ). The Captain worked on getting the “starter problem” fixed and we were wondering where we were going to watch the Super Bowl Game ! That decision was made easy for us as we were invited onboard the 110 ft Mega yacht, Picosa Lady, for the Game and dinner ! She was 2 slips away from us. Thanks Capt Nick and Super Chef Kelley !! Kelley served mouthwatering pulled pork sandwiches, hot wings and a fabulous salad chocked full of vegetables included kale. It was a delightful evening meeting their friends, Capt John and his first mate Lise, and other Crew members and first mates from nearby stationed Megayachts ! It was an exciting Game with relaxed and interesting people. 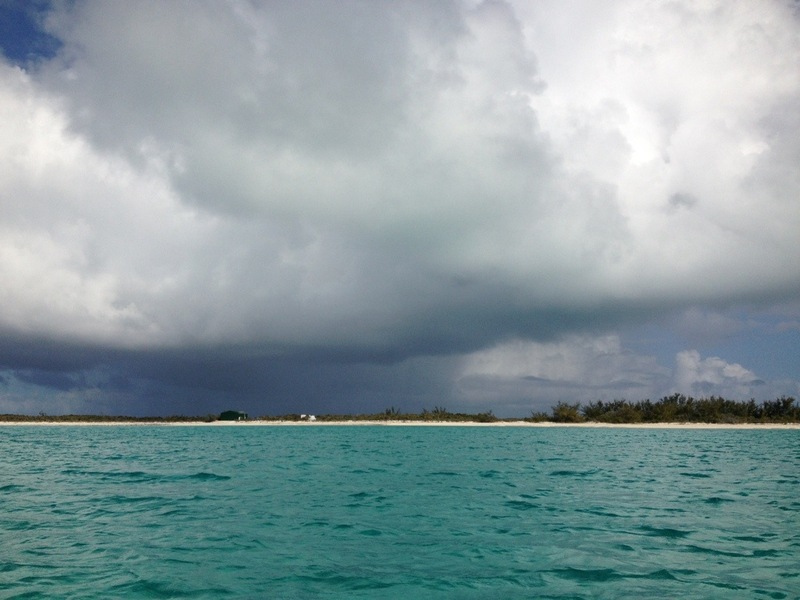 We now waited for a good weather window to leave to cross to Bimini. That window opened the next evening, we planned to leave at Midnite ! 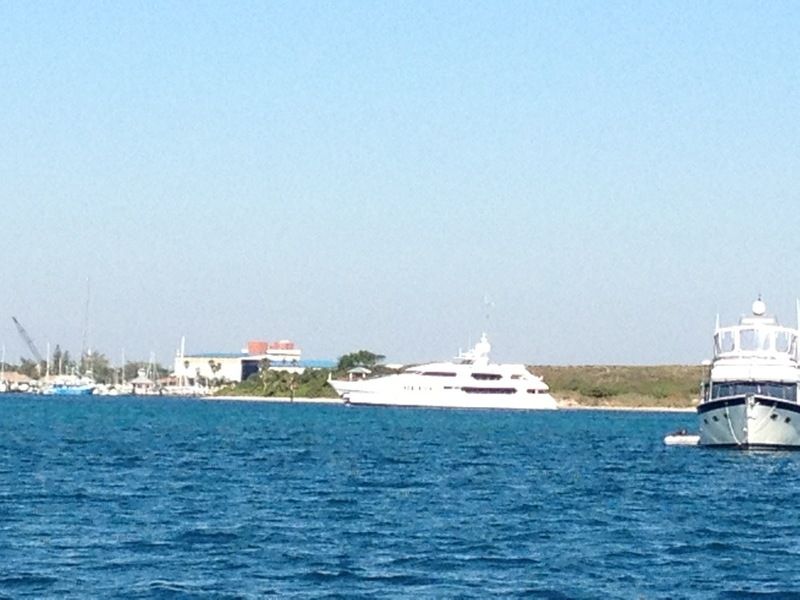 “Privacy” Tiger Woods yacht. Rumor has it that the name of the boat is covered with canvas when she comes into a dock so no one will know who it is. 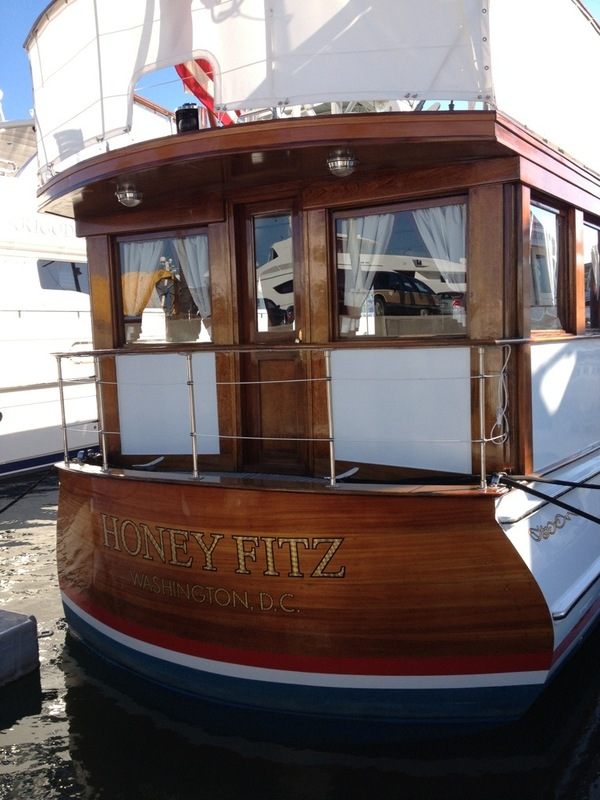 Honey Fitz still carries the Presidential Seal but is now privately owned and chartered out for small dinner cruises up and down the InterCoastal. 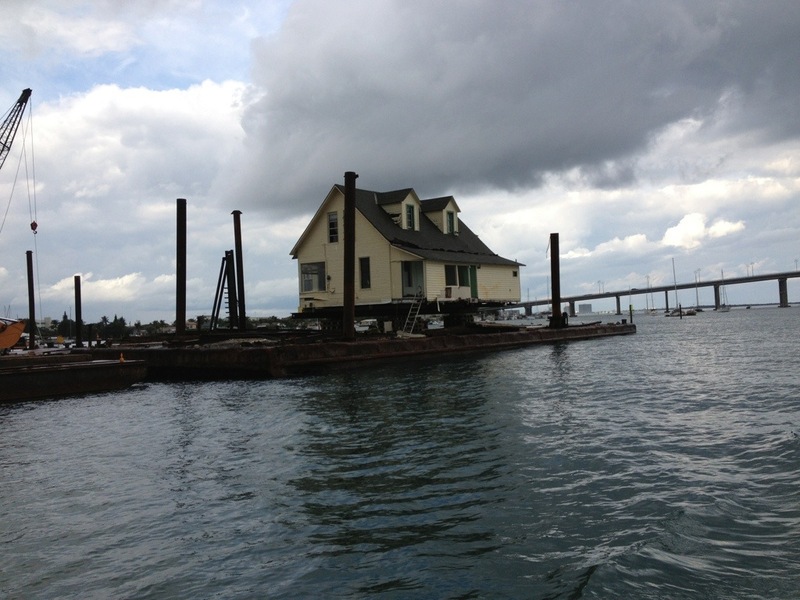 The current owner enclosed what was once an open aft deck to allow for more dining space. They did a great job maintaining the look of the boat but too bad they had to modify it! 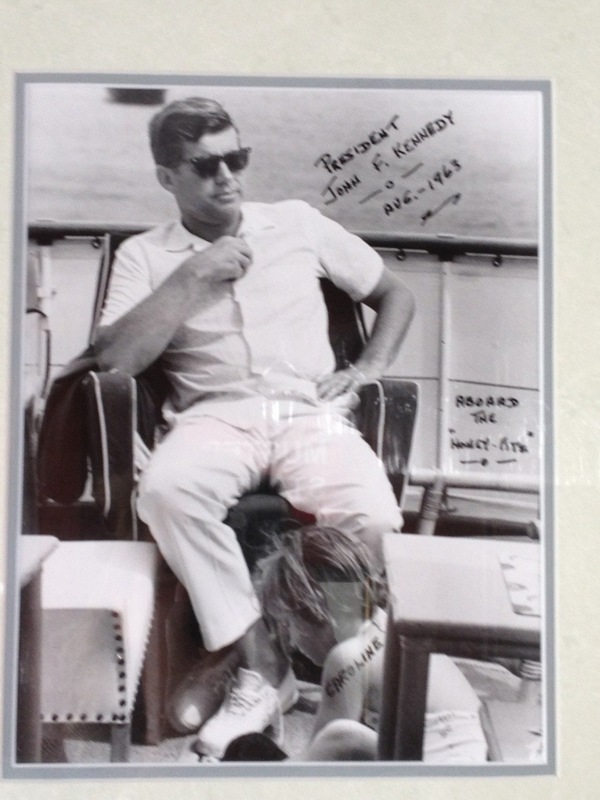 There were pictures throughout the boat like this one. The Captain was happy to show us around. Very contemporary, a work in progress. 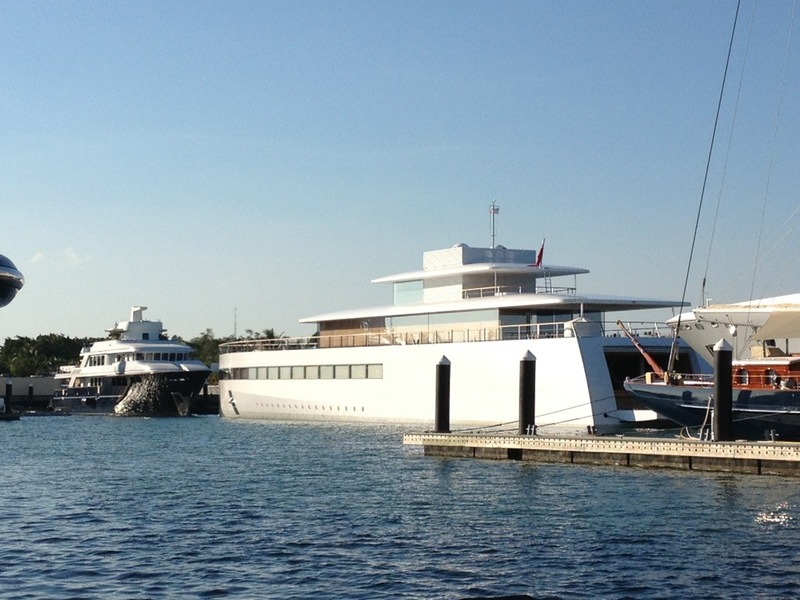 This vessel was being built for Steve Jobs. Wonder what will happen to it now. Our next boat?! 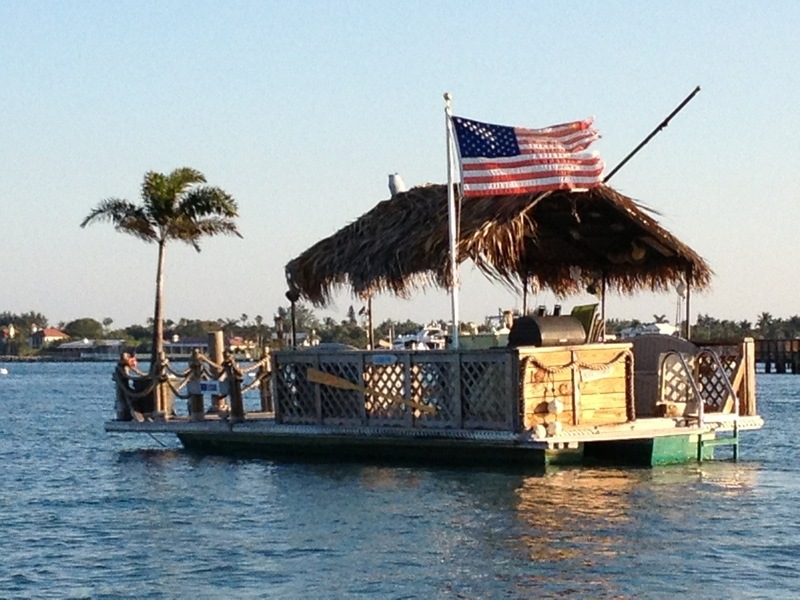 This floats on a mooring north of Peanut Island. Looks like a fun weekend hangout! 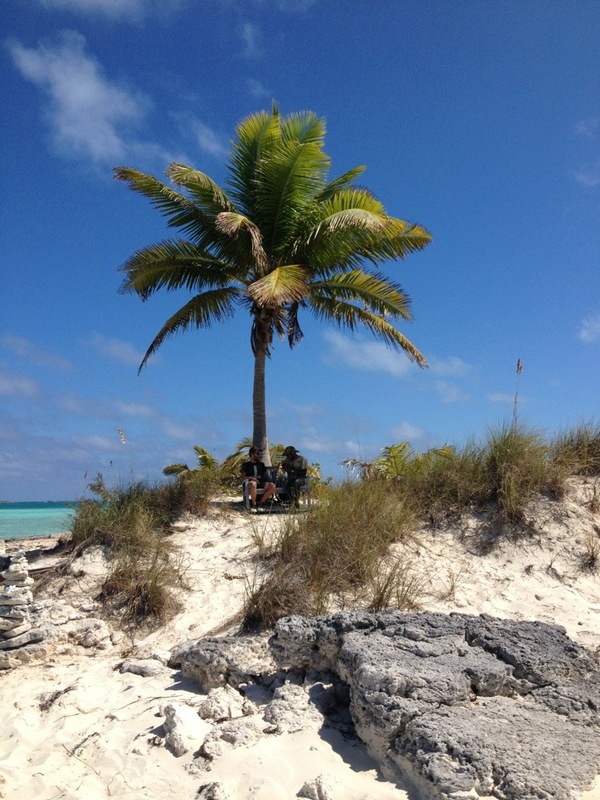 The Captain relaxed on Peanut Island. 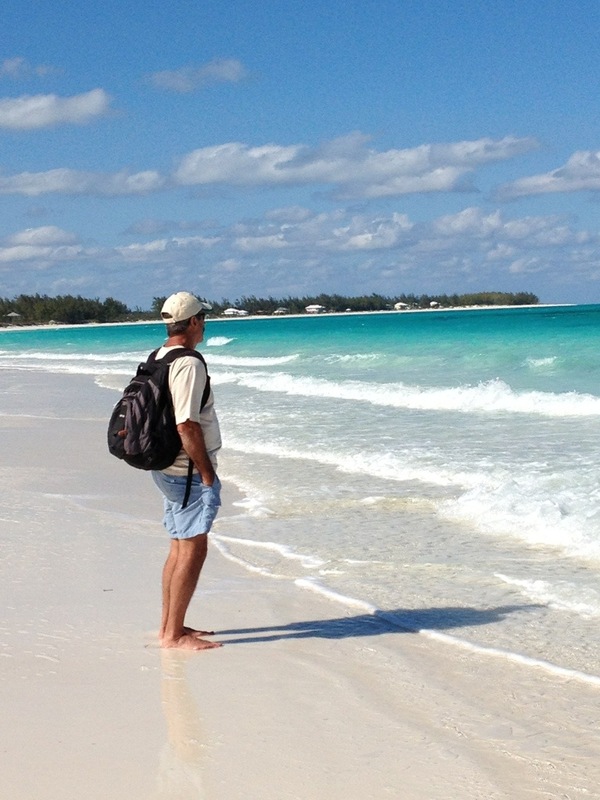 As long as he’s sitting in the dink he can drink a beer, but he can’t set foot in the sand! Crews Happy Hour at Rybovich Marina, $1 drafts and free pizza! 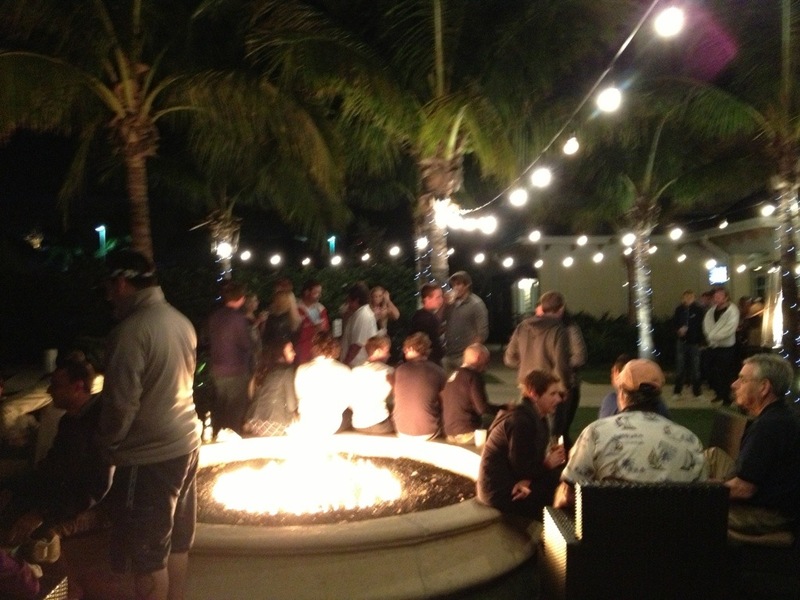 Love the gas fire pit…. Good idea for the Woodlands! Yah! Sue arrives in Ft Lauderdale! Artwork on the Ft Lauderdale strip. 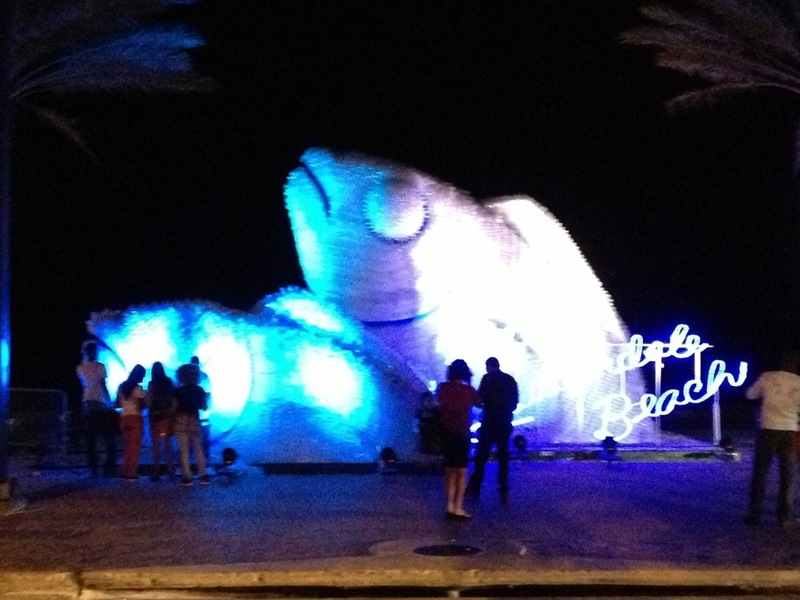 This sculpture was lined with empty water bottles and lite at night with a color wheel. Pretty clever! We transited 35 miles to Peck Lake. 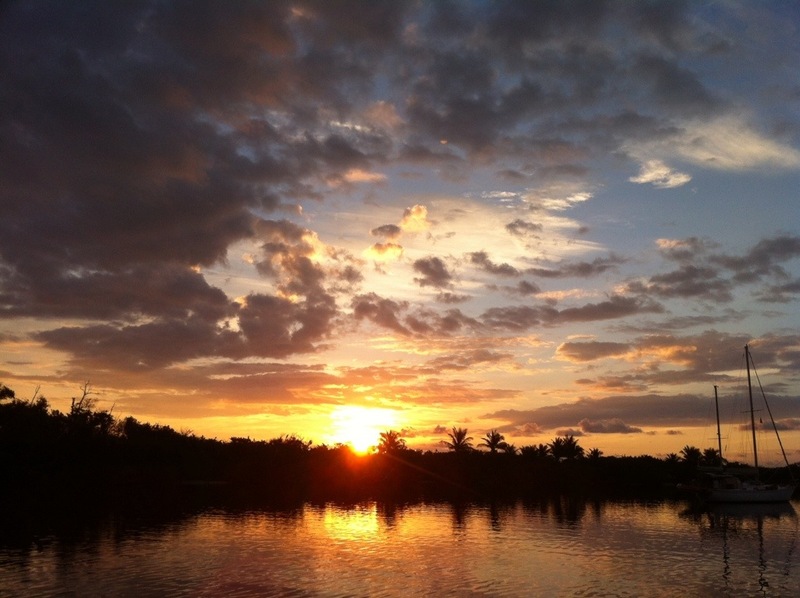 It was a leisurely motor ride arriving at dusk, we motored close to the sandy beach surrounded by green trees and lowered the anchor just after sunset. We were in the company of several other boaters but everyone was down below for the night. 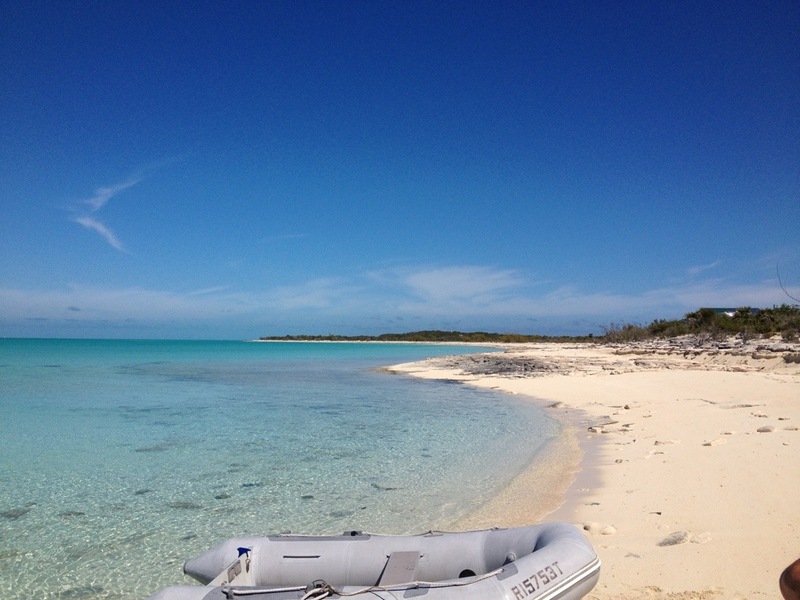 This was a very quiet and protected anchorage and the gentle breeze was very enjoyable. As we settled down with our evening cocktail we enjoyed listening to the rythmetic, thundering waves hitting the beach just 200 yards over the trees from our bow. 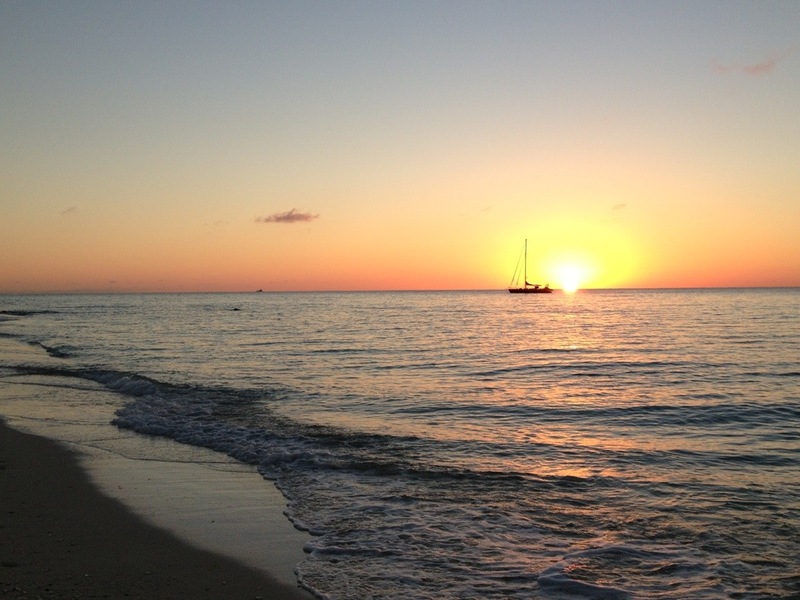 We planned to visit the beach at first light before departing…which allowed us to get this pretty sunrise shot. Within seconds the gentle breeze subsided and as we went on deck we discovered we were surrounded by Nosee’ms! They were so bad, they were swarming the boat. It was all we could do to lift anchor and motor away! The beach could wait for another day. Unfortunately many of those pesky gnats worked their way through our screens into the cockpit and down below. We soon discovered we’d acquired quite a few bites through the night and were plagued with them for several days. Once underway we opened all the hatches with the hope that the wind would carry them away! We were swatting those pests the rest of the day and the next morning! As we motored south the timing of the Bascule Bridge openings became a strategic part of our navigation plan. What’s the challenge? Each bridge works on a different opening schedule, and is spaced at varying distances from one another. Some bridges open on the hour and half hour, others on the quarter after and quarter of the hour, some open on demand and still others are fixed bridges typically 65′ tall depending on the water level and require no opening. If we don’t time the opening correctly by adjusting our speed, we miss the opening and sometimes have to wait a half hour, thus delaying our arrival time or forcing us to adjust our destination target. We learned the hard way that even if a bridge is scheduled to open on the half hour, it won’t open unless you ask the Bridge Tender to open it! So we call ahead for each bridge and sometimes are moving at near maximum motor speed (a whopping 7.5 kts) so as not to miss an opening! Our experience with bridges on the ICW thus far has been pretty uneventful but ahead of us the frequency of bridges in our path is about to increase exponentially! From Vero to Peck Lake we travelled under 6 bridges, from Peck to Lantana we travelled under 11 bridges. By the time we reach Fort Lauderdale we’ll travel through another 18 bridges! 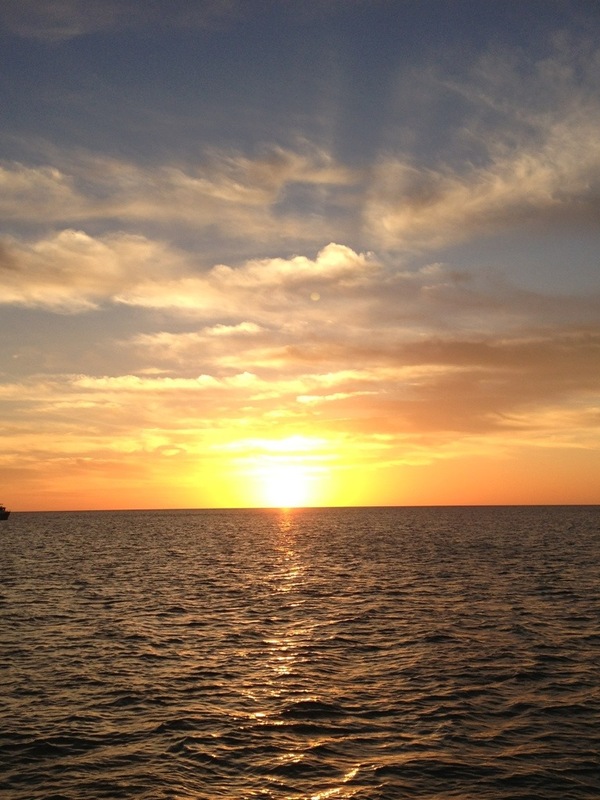 That’s why many boaters travel outside via the ocean…. But thus far the weather has not been with us and strong winds and high surf are scheduled for the next week, so to keep moving, we’re staying inside! 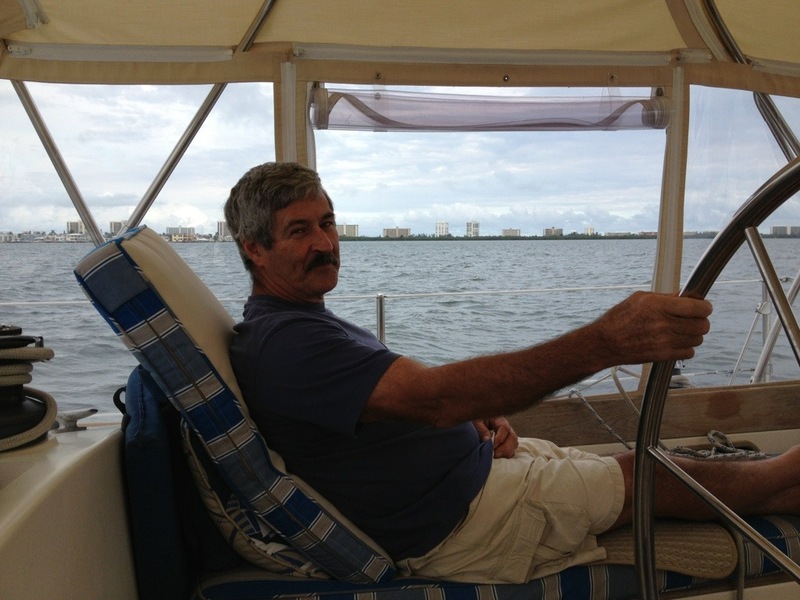 As we arrived in the N Palm Beach area Adrien call a fellow boating friend, Clayton, from Warwick, RI, who has a winter residence in a high rise overlooking the ICW. As we motored by his condo we heard a loud whistle and we saw Clayton on the banks waving! He ran down 11 flight of stairs to meet us and take a photo of Dolphin passing by. We agreed to get together in the next few days since we’d be staying in the area. 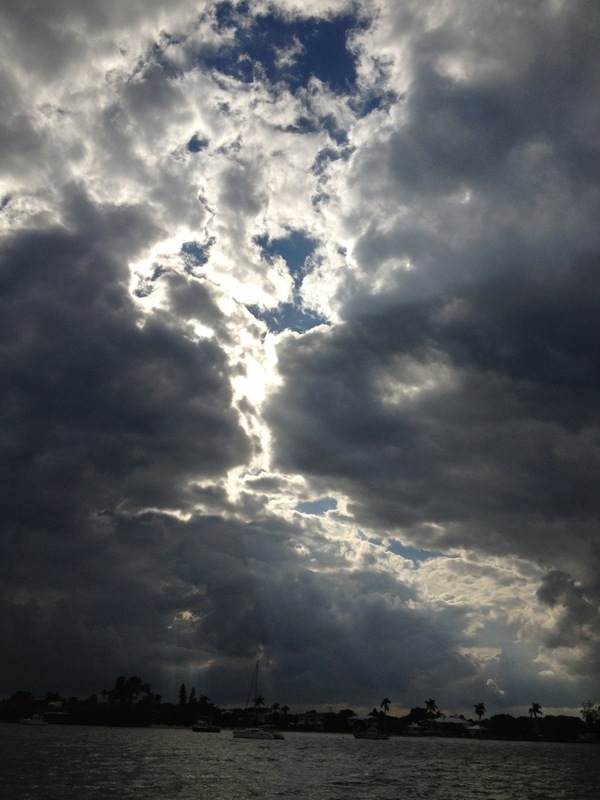 The day had turned cloudy and shortly thereafter we found ourselves in the middle of a heavy rain shower. It was hard to see out the isen glass to oncoming traffic. We both realized that this was the first time it has rained since we left Brunswick in early January and first time on our journey that we were traveling in the rain. Alleluia!!! Alleluia, Alleluia!! !” …. And in walked Sister Mary Rose Alma. And the last nun, Sister Mary Andrea, knew all the easy questions were gone! 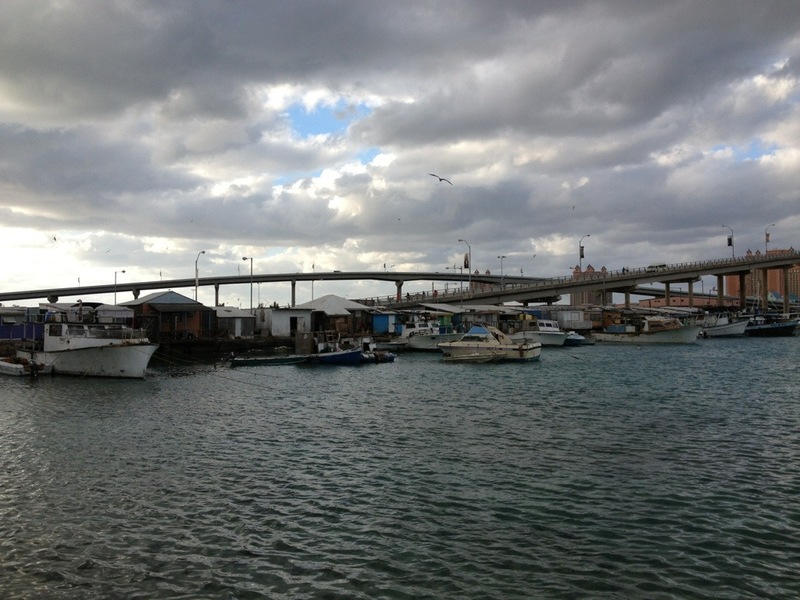 Continuing 10 miles further south, and under a few more bridges we arrived at the Loggerhead Marina in Lantana at 16:45. We were greated by Alex and his helper who helped us tie off and get settled. 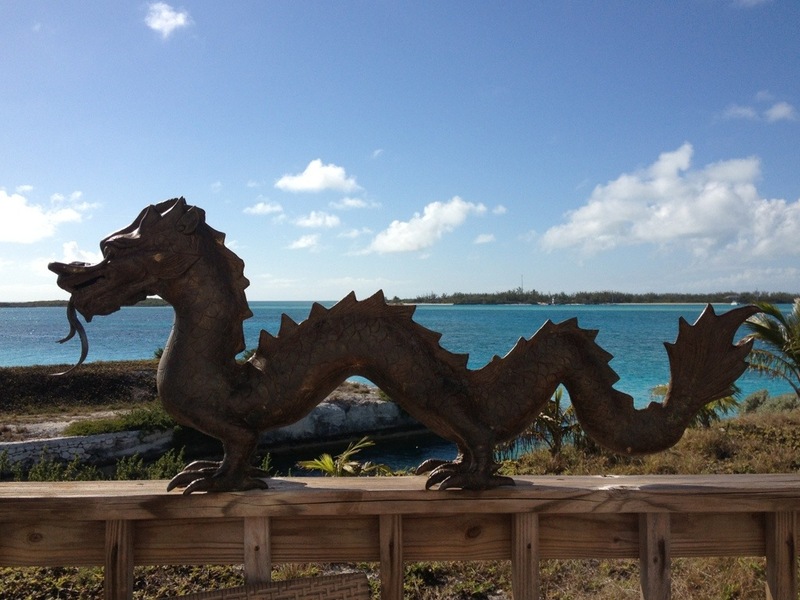 We checked in with the Dock Master, and Alex gave a tour of the facility. You’ll see from the pictures it was lovely. The pool, showers, saunas, jacuzzi, and fitness center and club/meeting/billiard rooms are part of a high end condo complex and top notch! We pulled in bow first to our designated slip but soon found out we were too far from the electrical outlet to hook up! The slip next to us was empty so the CAptain decided to unfasten the dock lines and manually move and wiggle Dolphin between the concrete dock and the wood pilings. We had to lift the Dinghy (on davits) over the electrical boxes to get her to squeeze by! Leave it to Adrien to pull that off! Dolphin rested here while we left to join the Kings for three nights in Delray Beach. Adrien has known the Kings since the mid 80’s. Bob a former retired boss from Raytheon, and Sandy his lovely wife are affectionately referred to as our ‘surrogate parents’ ! 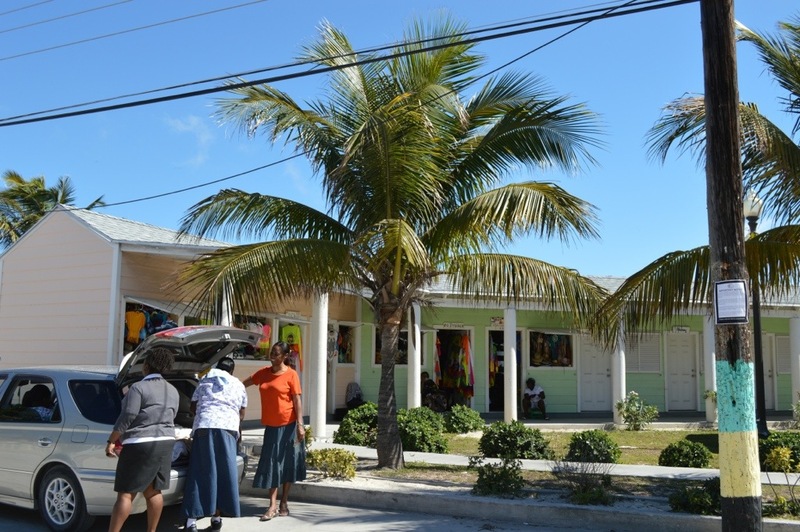 They have invited us to join them at their winter home in years past and this year entertained us and helped us provision for our Bahamian Trip! Adrien enjoyed a few rounds of golf with Bob; and, Sandy arranged for my much needed pedicure! We enjoyed Happy Hours promptly at 16:00, delicious meals, lots of laughs and the excellent chauffeur services all around the area as we gathered a carload of supplies! Back to Dolphin on Friday, we enlisted the help of the Deck hands and their golf cart to transport our provisions from the car to the boat. It took a full 4 hours to find a place for everything! After unpacking we connected with Clayton and met he and his wife Robin at 18:00 for a delicious dinner at Maison Carlos, a quaint French restaurant on the outskirts of West Palm. The cheese soufflé was out of this world!!! 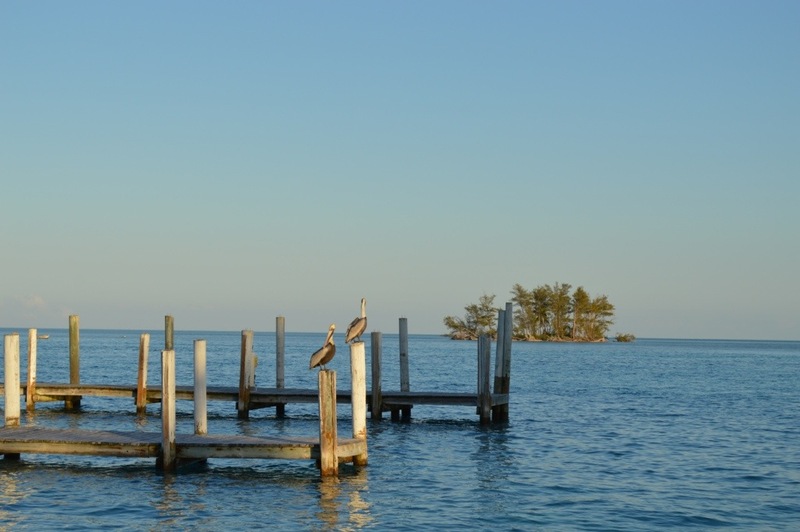 We were up and off the dock at 7:45 on Saturday morning to motor 10 miles north back to Lake Worth to position ourselves for the much anticipated crossing to the Bahamas! By now we have bridge openings “down pat”, and we perfectly timed the 4 we needed and arrived by mid morning and anchored near “Rapsody in Blue”‘ friends we met in Brunswick. 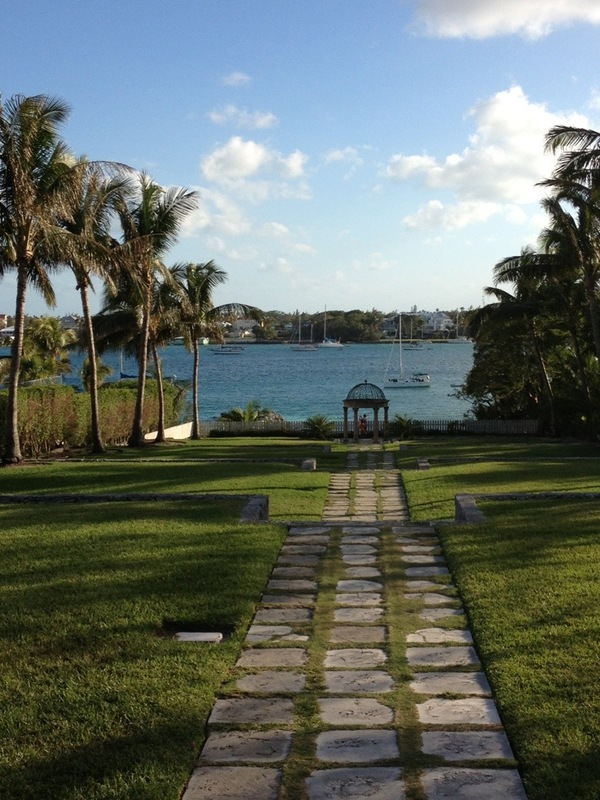 Our landing at Ocean Club Marina afforded us a comfortable nights sleep and the luxury of a leisure morning! We checked in with the Dockmaster and were pleasantly surprised to learn that we could stay on the fuel dock until the Barge Canal Lock opened at 18:00; and, since we arrived so late the night before and did not plan to stay long enough to take a slip, we were given quite a deal . We promised to be discrete about the details! 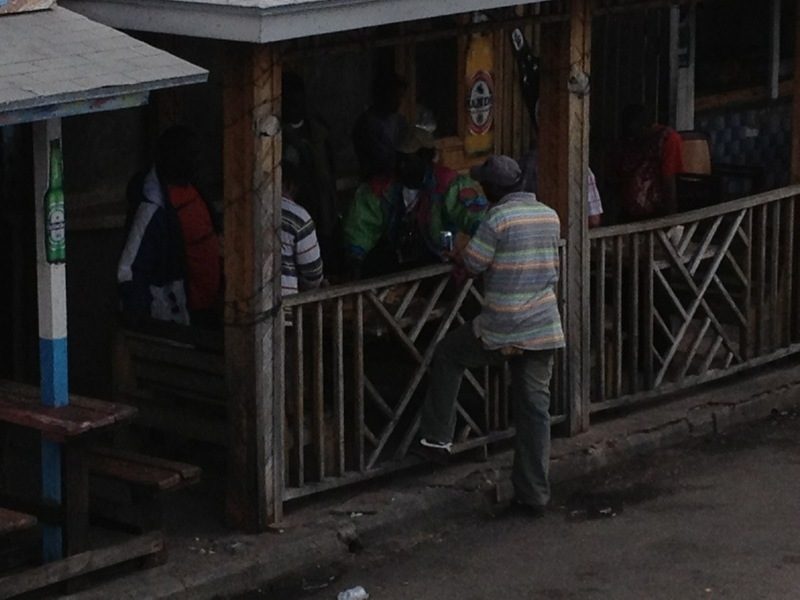 Unbenounced to us, the locks were being repaired and only opened from 18:00 to 21:30 each day. What a gorgeous day, clear blue skies and approaching 80 degrees this was just what we needed! Finally warm sunny weather! FL was welcoming us! With no place to go we were forced to enjoy a day of rest and relaxation! It was not hard to do! 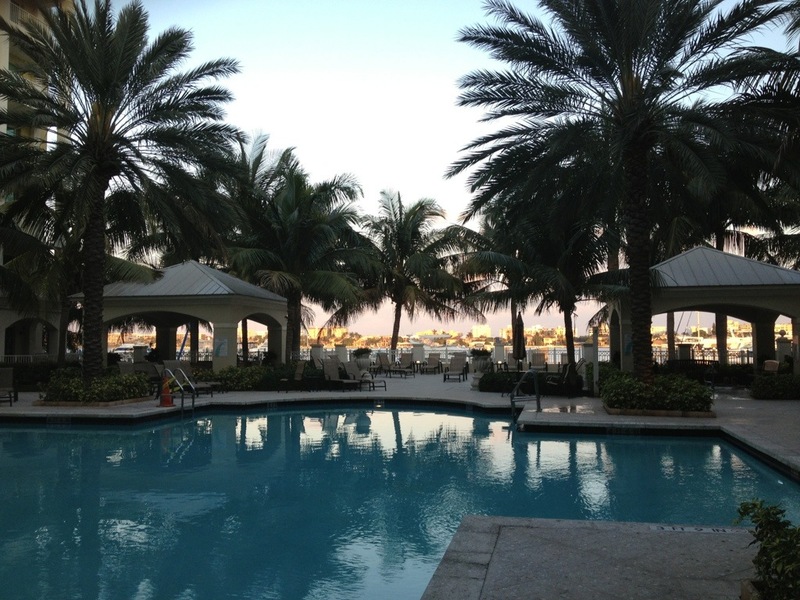 With electronics in tow it was a short walk to a beautiful pool surrounded by palms with piped in music and wifi. 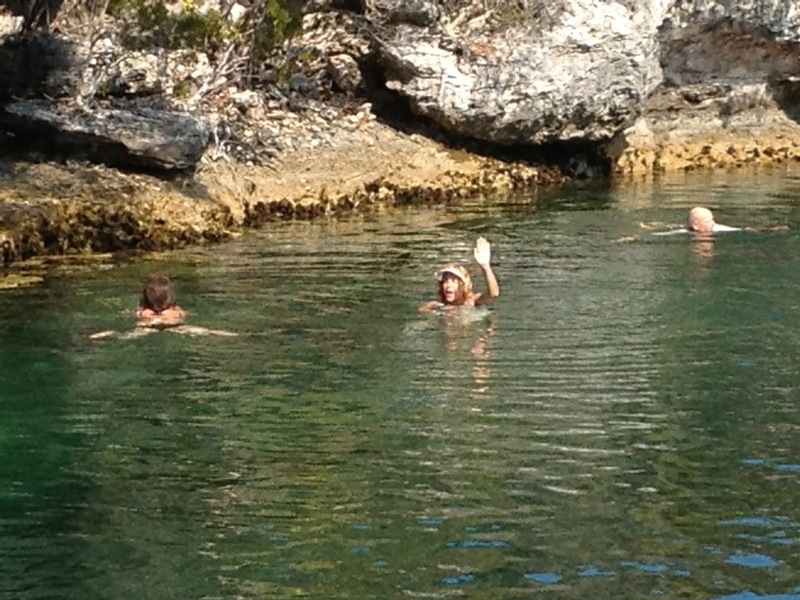 While basking in the sun Adrien caught up on Emails, and took a dip while Nina caught up with a few business calls. On the way back to Dolphin we met up with live-a-board, Peter on ” Bel Conta” a Formosa. 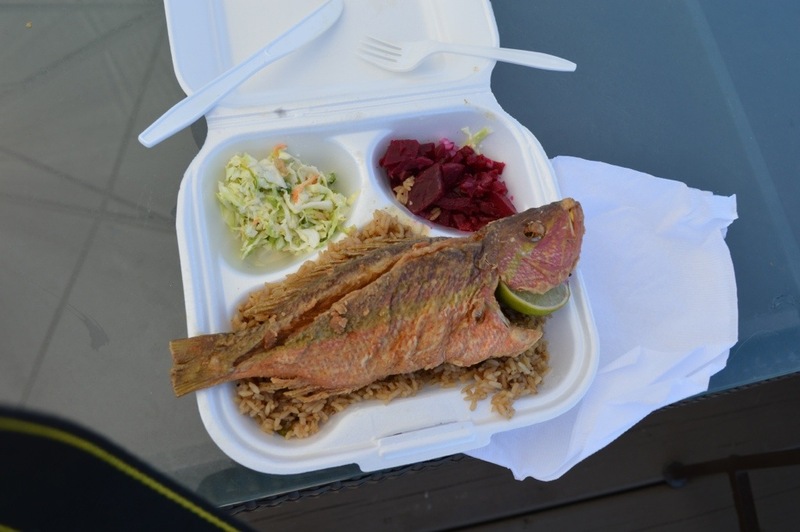 With local knowledge, he recommended a few restaurants for lunch within walking distance. 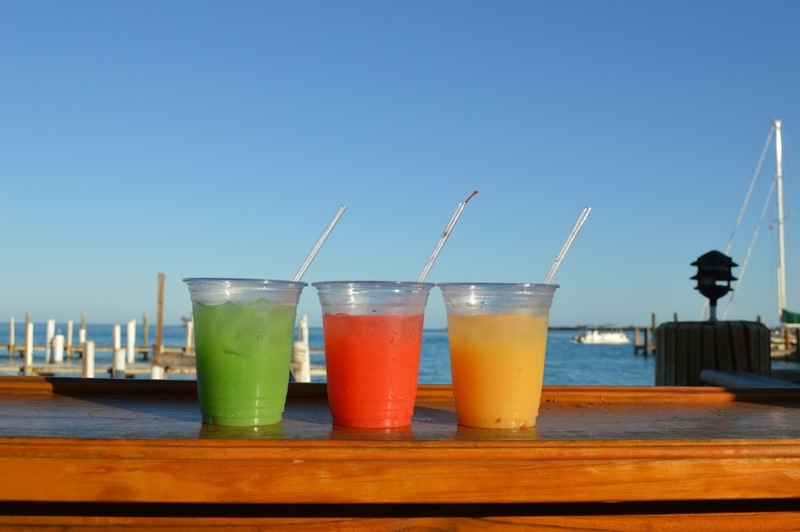 He accepted our invitation to join us at Grills, a local tiki fish restaurant, for delicious Mahi Tacos and a Mahi Rubin on sunny deck of overlooking the inner coastal. 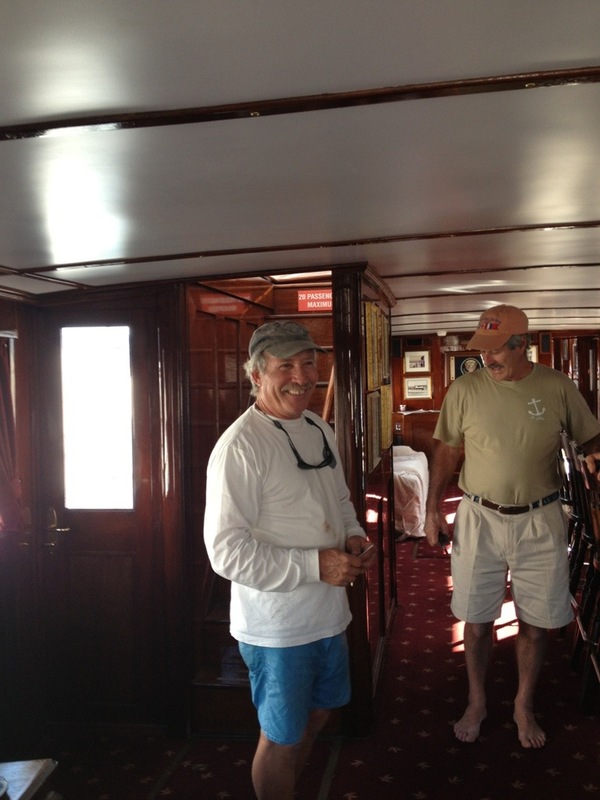 We shared stories and stopped at a few hardware stores for odds and ends on the way back to the Marina. 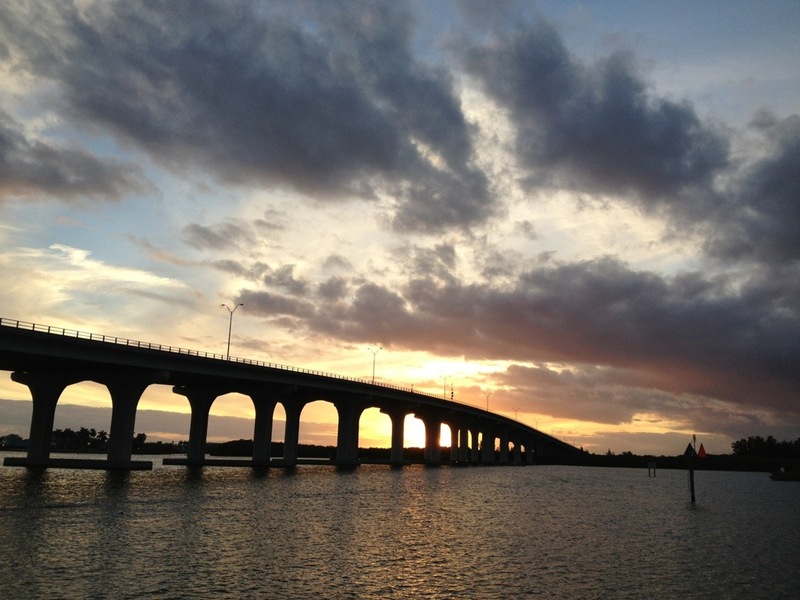 After a few chores we refueled, topped off the water tanks, called the bridge tender for an opening and left the dock at dusk to make two bridges, a barge lock and 6 mile ride to Cocoa Beach. It was dark and a bit difficult in the narrow channels. Since we started our trip we have not run at night unless we were outside with lots of water around us, so we were both on high alert with a Million Candle Power lantern on hand and Nina taking the bow watch to sight our channel markers. We arrived safely, secured the anchor and enjoyed a comfortable night. The next morning the Admiral rowed the Captain ashore for breakfast and a walk. 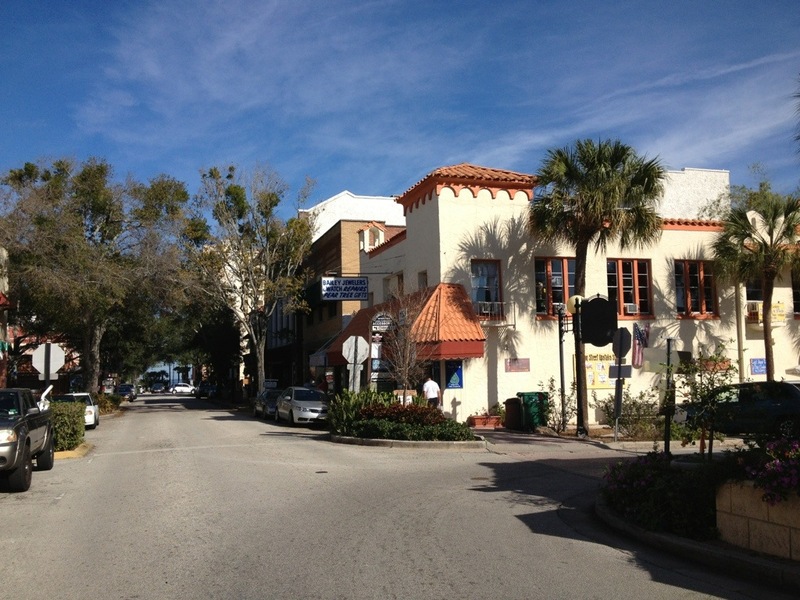 Cocoa Beach is a charming village with lots of shops and a beautiful waterfront park. They also offer a very nice dinghy dock for boaters, very welcoming. 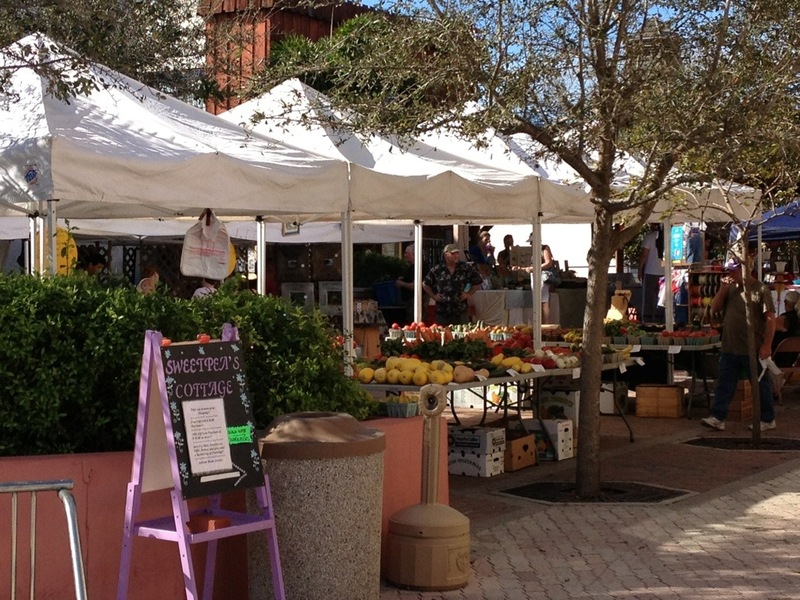 It was a short walk when we came upon an outdoor market and coffee shop, Ossorio’s, with a row of umbrella covered tables curbside and a walk up window to order breakfast. We placed our order then realized the tables filled up quickly. 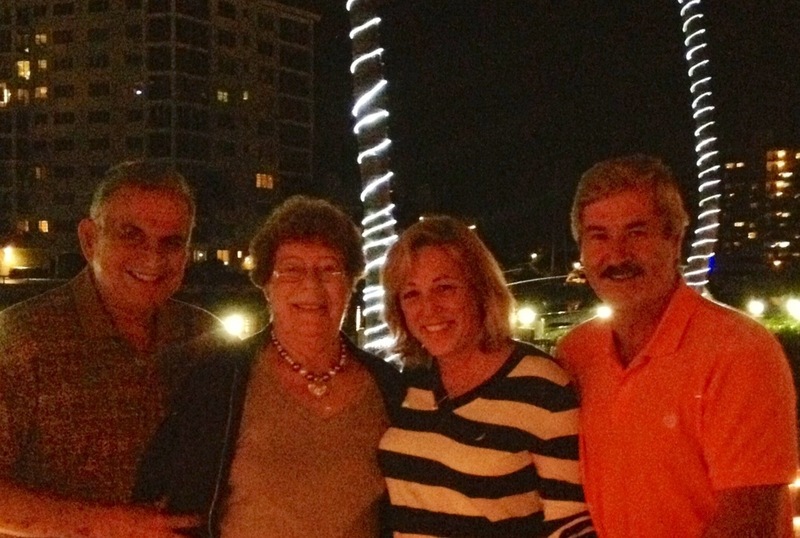 Sue and Larry, a lovely snowbird couple from Dayton, OH invited us to share their table with them. Before you knew it we were fast in conversation while Nina enjoyed a delicious omelet with Brie and roasted asparagus, and Adrien, scrambled eggs with ham and cheese….not so good! With half a day on the water our next stop brought us to Serenity Island just south of Melbourne. We anchored in 7′ of water protected from the south wind and sipping cocktails while enjoying the aroma of a campfire built by a few campers on the island. We were also treated to a few fireworks. The next morning the ICW was like a mirror as we resumed our trip south. We intended to put in a full day of motoring…… but plans have a way of changing! By late morning the winds freshened and we were able to set sail and shut down the motor. 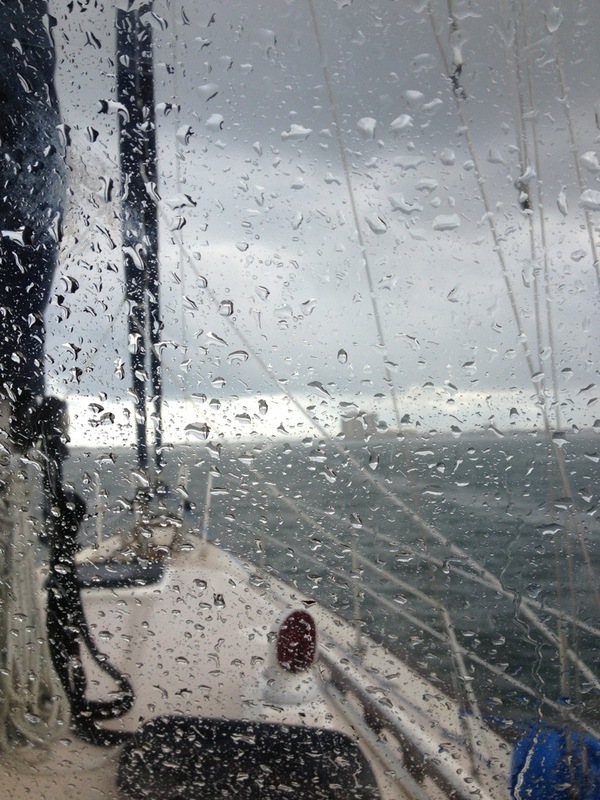 It’s the first time since transiting the Potomac in early November that we’ve been able to sail! Evidence of a relaxed Captain! Going a breakneck speed of 4.2 kts with the Genoa, it was so peaceful as we sailed by beautiful homes, birds and passing vessels. As we approached Merrill P Barber Bridge (Rt 60) , two boats we were transiting with take a sharp left turn into the Vero Beach Municipal Marina. We kept going but it got us curious so Nina looked it up…..
Free bus service to market hardware stores and TJMaxx….. What more could we want! We made a U turn and came back under the bridge and grabbed a mooring for the night… or so we thought. 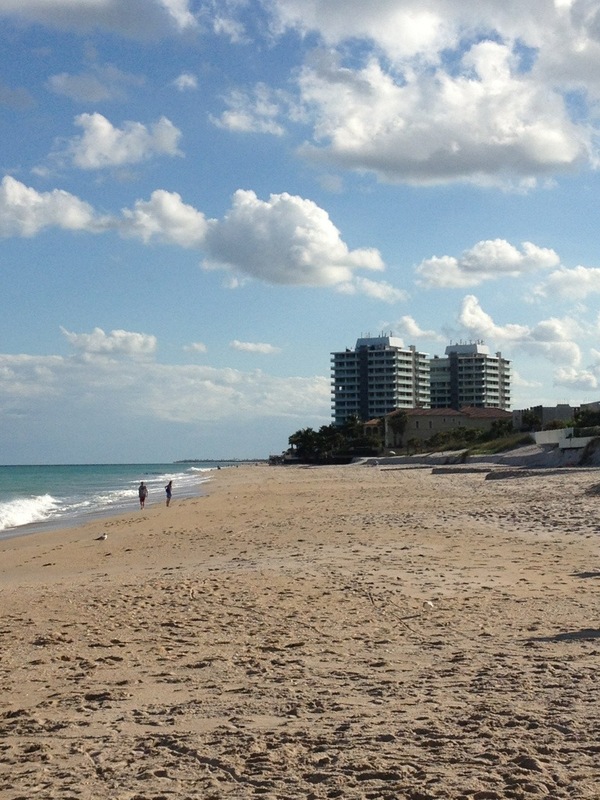 It was still early in the afternoon and sunny so the first order of business was a 4 block walk to the beach! 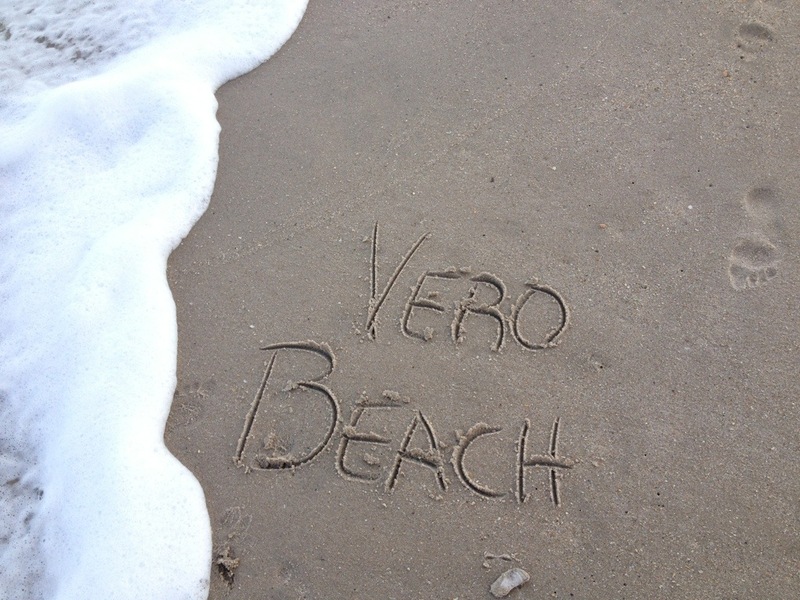 Ohhh, to feel the warm white sand tickling our toes! Of course Adrien made sure we were back by 5:00 for Happy Hour! The first folks we talked to knew our friends from home, the Graves on Ciao! 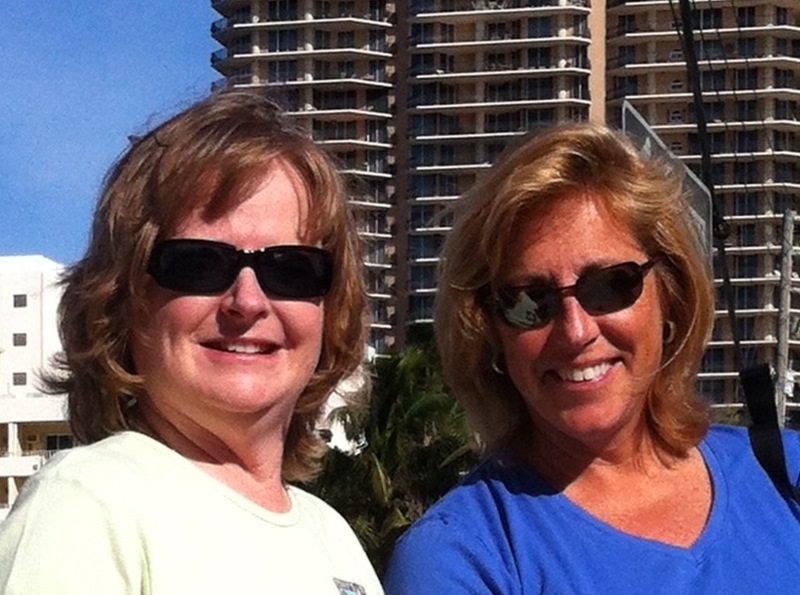 They cruised together several years ago…what a small world! We met several other boaters, some that live aboard in this harbor and are very involved in the community. 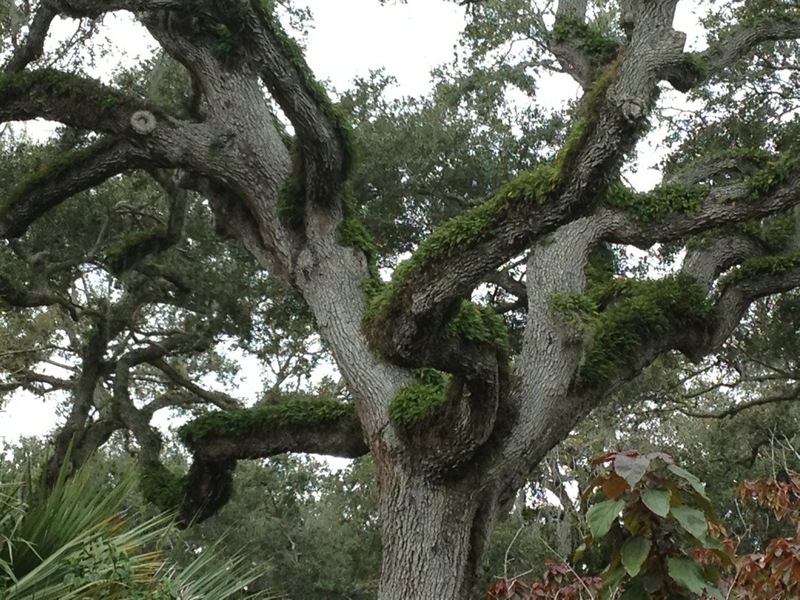 We learned a lot about the area and all it has to offer as well. were Pat’s Fans! 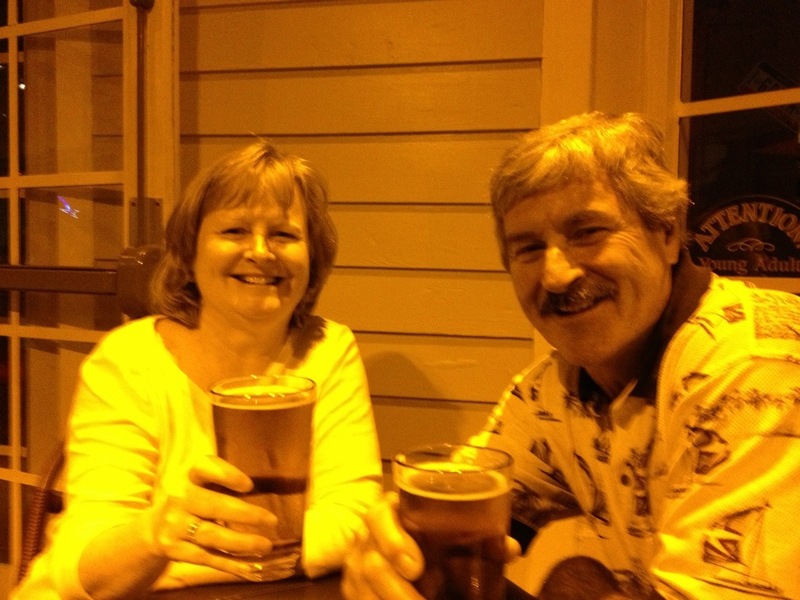 As we were about to leave, in walked Darrell and Ruth from , Night Cap II. We met them in Atlantic Highlands at Sandy Hook, NJ and travelled down the coast of New Jersey, up the Delaware River and into the Chesapeake….then lost touch around the time Hurricane Sandy made her appearance. It was a great reunion; we caught up on each others journeys and agreed to dine together on Saturday night. 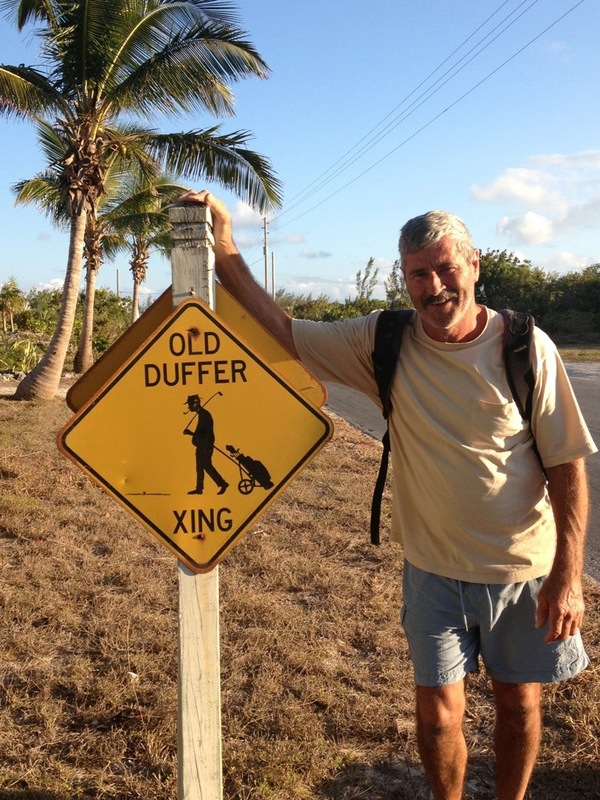 As we dinked back to Doplhin we came upon Dean and Susan on “August Borne” from NH. We met them in Sandy Hook as well! We’ve been texting along the way but were always several days apart so it was nice to reconnect. On Saturday morning we walked back towards the beach hoping to find a good cup of coffee and light breakfast. No luck with the coffee but we did happen upon a Farmer’s Market with all kinds of freshly made foods, fresh vegetables and trinkets. We enjoyed a delicious ham and cheese crepe and tasty crab cakes as we explored the booths. 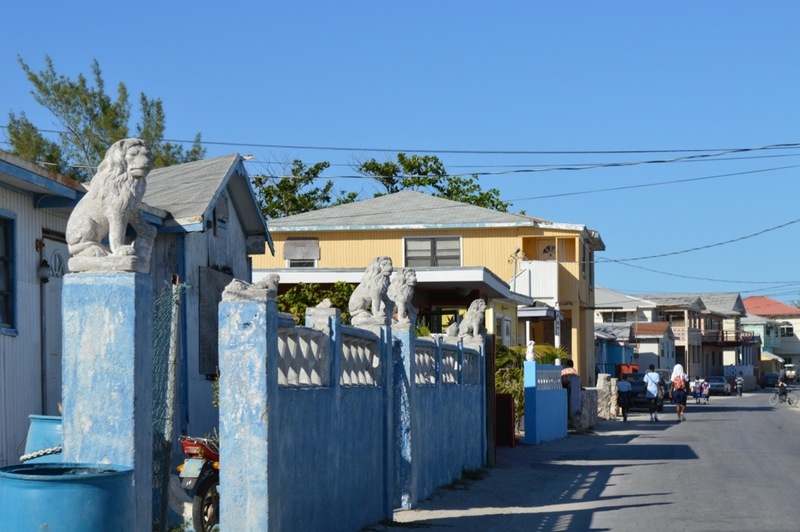 As we walked back towards the beach we came upon an open house for beach front condo’s. I can’t resist these so in we went! 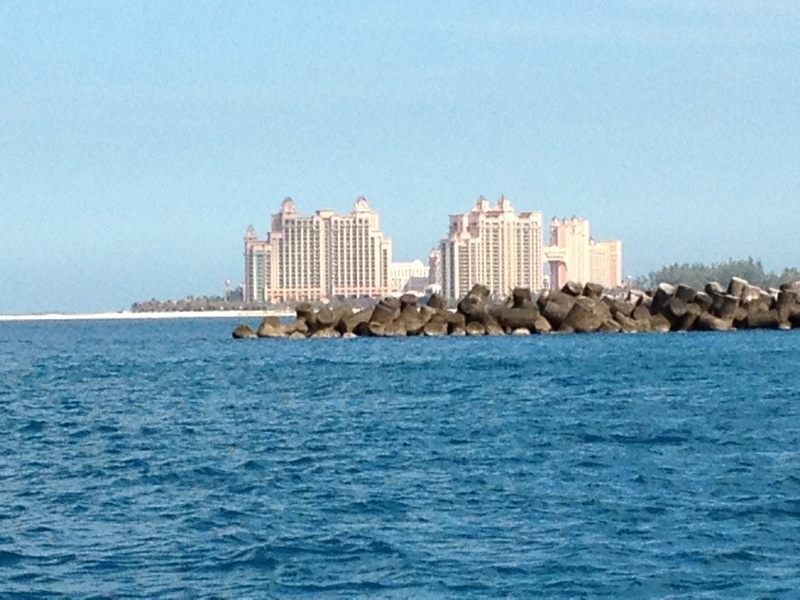 These condo’s were georgious….priced in the $3M’s! I felt a bit out of place wearing flip flops, cargo shorts and a fanny pack but what the heck, some of the most wealthy folks look pretty grungy right? I took a few photos for my idea book and we politely declined to make an offer! The tide was up, the surf was pretty rough making a beach walk out of the question, so we pulled up a stool up at Mulligans and enjoyed tall spicy Bloody Mary’s and chatted with stool neighbors that were also moored in the harbor, “Water Hog” from Stonington, CT.
Back to Dolphin we had just enough time to get dressed and pick up Ruth and Darrell via dink to Riverside Cafe where 50% off Happy Hour drinks started at 17:00! We had a great night and delicious dinner but when it was time to go it was pouring! We made it back to Night Cap II and were invited in for….a night cap! 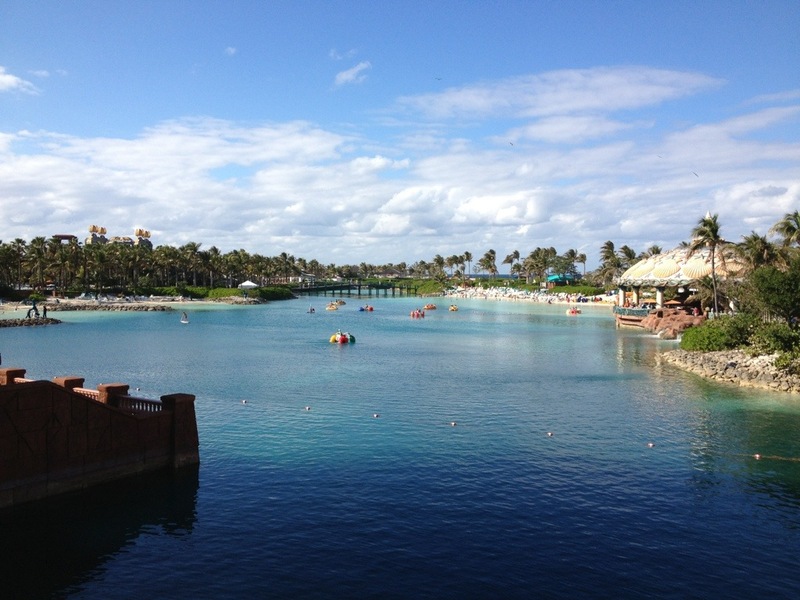 Back to Dolphin for a good nights sleep….we were leaving in the morning! 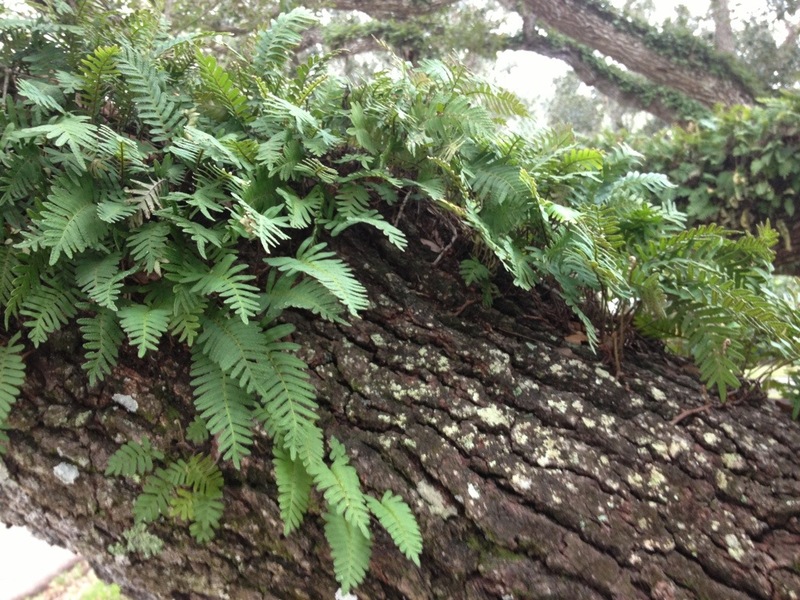 In FL the Live Oaks are adorned by ferns! Up early to a clear sunny morning we decided to take a dink ride through Riverside Gardens, a community of homes on a winding canal just north of our mooring. We enjoyed a peaceful ride admiring homes, each unique with well groomed gardens and all kinds of boats at their docks. 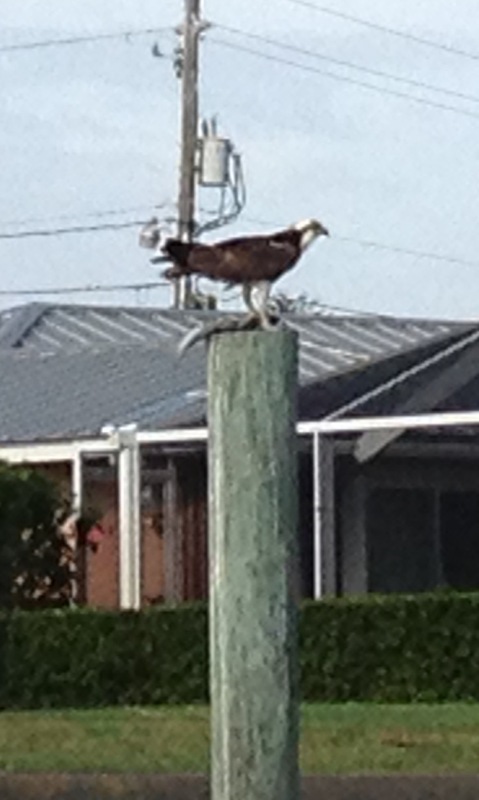 The birds enjoyed this neighborhood as well; osprey and pelicans were plentiful. Saying Good Bye to our friends as we motored out of the mooring field, we were underway by 11:30. Our one night stop turned into three and it was so much fun!